The Hanging Temple, also Hanging Monastery or Xuankong Temple (simplified Chinese: 悬空寺; traditional Chinese: 懸空寺; pinyin:Xuánkōng Sì) is a temple built into a cliff (75 m or 246 ft above the ground) near Mount Heng in Hunyuan County,Datong City, Shanxiprovince, China. The closest city is Datong, 64.23 kilometers to the northwest. 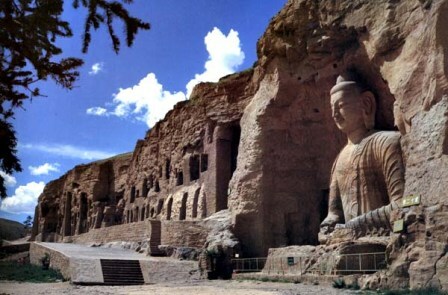 Along with the Yungang Grottoes, the Hanging Temple is one of the main tourist attractions and historical sites in the Datong area. Built more than 1,500 years ago, this temple is notable not only for its location on a sheer precipicebut also because it is the only existing temple with the combination of three Chinese traditional religions: Buddhism, Taoism, and Confucianism. The structure is kept in place with oak crossbeams fitted into holes chiseled into the cliffs. The main supportive structure is hidden inside the bedrock. 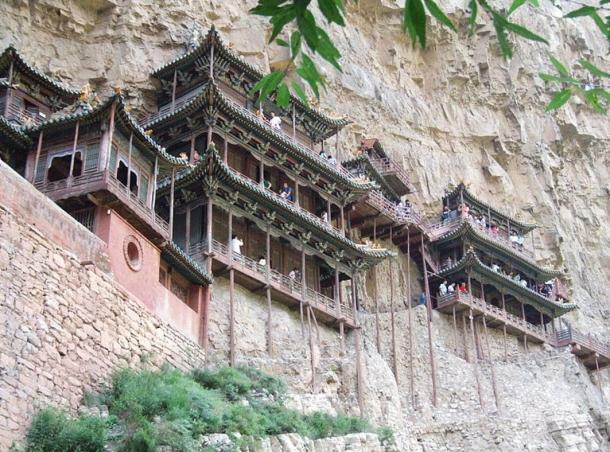 The monastery is located in the small canyon basin, and the body of the building hangs from the middle of the cliff under the prominent summit, protecting the temple from rain erosion and sunlight. Coupled with the repair of the dynasties, the color tattoo in the temple is relatively well preserved. On December 2010, it was listed in the “Time” magazine as the world’s top ten most odd dangerous buildings. According to legend, construction of the temple was started at the end of theNorthern Wei dynasty by only one man, a monk named Liao Ran (了然). Over the next 1,400 years, many repairs and extensions have led to its present-day scale. Hengshan, or Mount Heng, which is located in Shanxi province, is one of China’s Five Great Mountains. 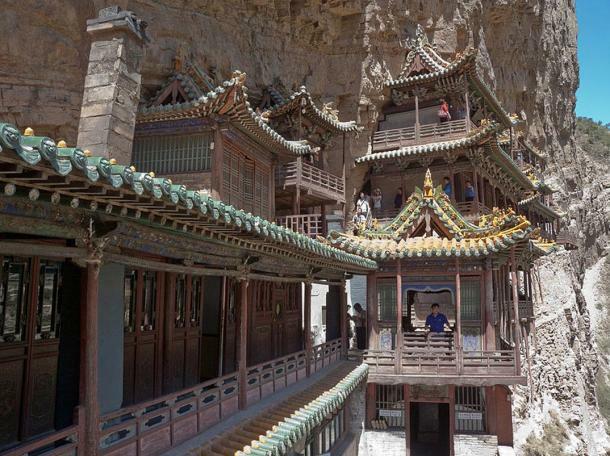 Pinned to the side of its cliff face is the Xuan Kong Si, also known as the Hanging Monastery. Despite its precarious position, the monastery has been ‘hanging’ in its original position for more than 1,500 years, a testament to the ingenuity of its builders. 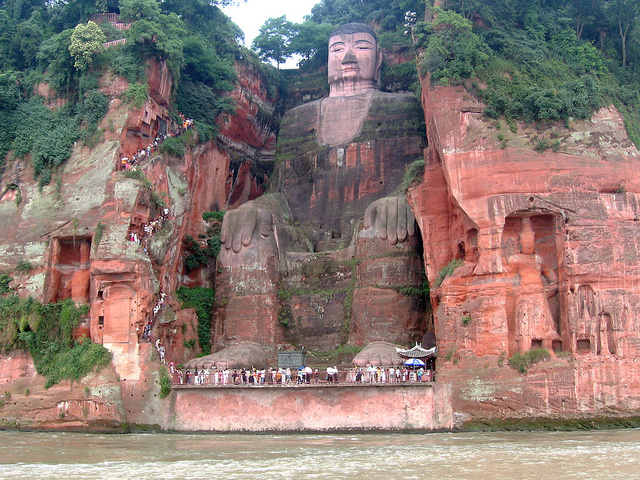 The Hanging Monastery is said to have been built in 491 AD, during the late Northern Wei Dynasty. It is commonly believed that the building of the monastery was initiated by a single individual, a monk by the name of Liao Ran. In time, however, Liao Ran received help from Taoist builders, who were drawn to the site due to its peaceful and serene atmosphere. The site was perfect for those engaged in meditation, as noises from the ground did not reach such lofty heights. In addition, its height ensured that the monastery was safe from floods. The Hanging Monastery is also protected from rain, snow and sun as it is sheltered by the mountain’s peak. This is one of the reasons for the monastery’s continual existence over the centuries. In order to provide support for the monastery, holes were first drilled into the side of the cliff. Wooden pillars were then half inserted into the rock as the foundation. The monastery was then built on top of these pillars, with additional support from the rock at the back of the building. Some have claimed that the wooden pillars were not present when the monastery was being built, and that the building would be able to support itself should the pillars be taken away. The pillars, it is further claimed, were added later on, as visitors did not dare climb up to the monastery for fear that it would fall. 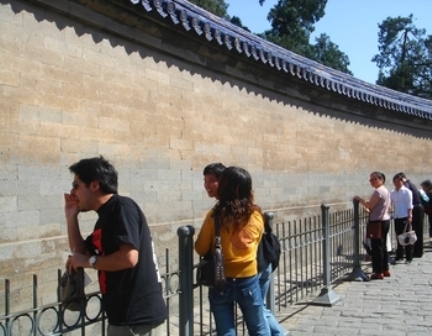 It was subsequently enlarged over the centuries, and was also restored in 1900 during the Qing Dynasty. Apart from being an architectural marvel, the Hanging Monastery is also a unique structure from a religious point of view. The monastery is dedicated to three religious systems – Buddhism, Taoism, and Confucianism, all of which co-exist harmoniously in the building. In the San Jiao Hall, for instance, the statue of the Sakyamuni Buddha is enshrined together with that of Lao Zi and Confucius. These are the founders of Buddhism, Taoism and Confucianism respectively, their existence side-by-side showing the harmony between the three systems in this sacred space. 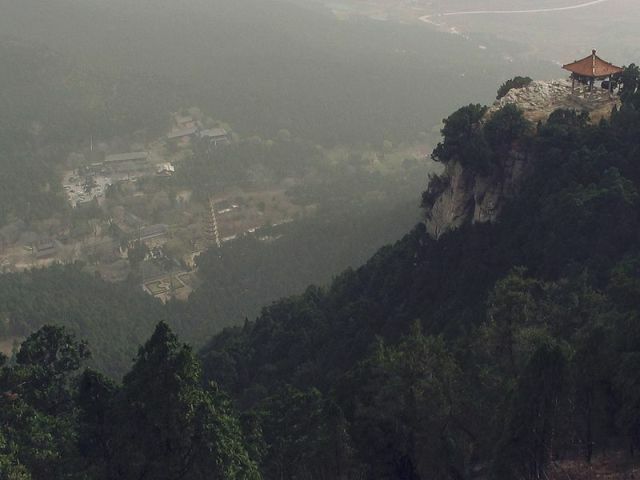 It has been claimed that the Hanging Monastery once served as a sort of ‘transit station’ for travellers who passed through the area, due to the remote nature of the Hengshan area. It was at this place that weary traveller could get a meal and some rest before setting out again. Due to the prevalence of religion at the time, it is said that people were reluctant to enter the places of worship of religions other than their own. To ease these travellers’ anxiety, the three major religions of China were enshrined in the Hanging Monastery. 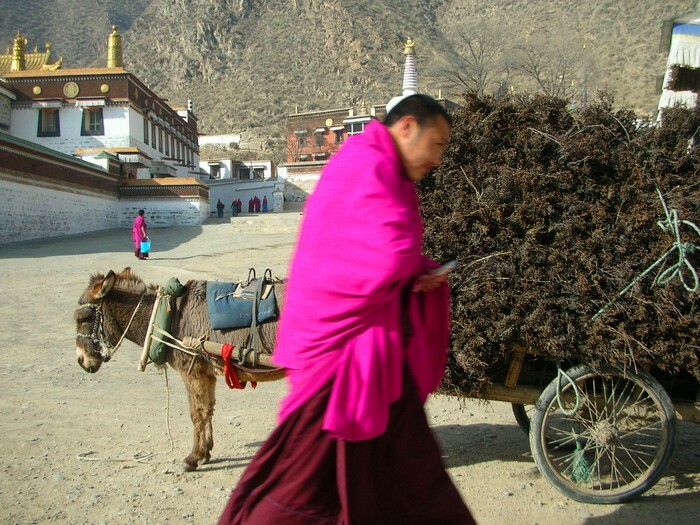 In this way, more travellers could stay at the monastery for a while before resuming their journey. 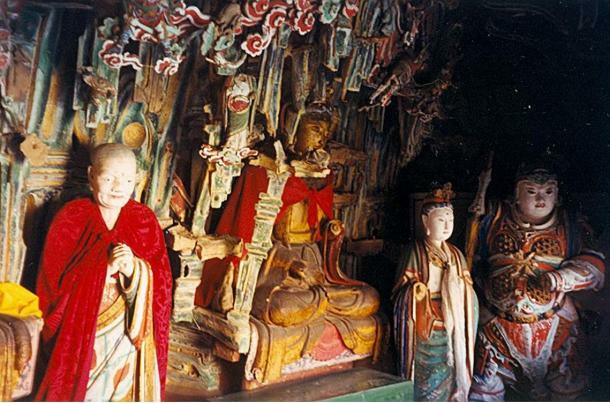 Throughout the monastery, there are about 80 sculptures of important Buddhist, Taoist and Confucian individuals. These figures are made of various materials, including copper, bronze, iron, terracotta and stone, and are carved vividly. In the San Sheng Hall, for example, there is a seated statue of the Buddha. At his sides are a number of his disciples, portrayed as standing submissively to their master. There are six main halls and 34 lesser halls, making a total of 40 halls, in the monastery. These halls are linked by a maze of passageways. Today, the Hanging Monastery is probably not the best site for meditation due to its transformation into a tourist attraction. 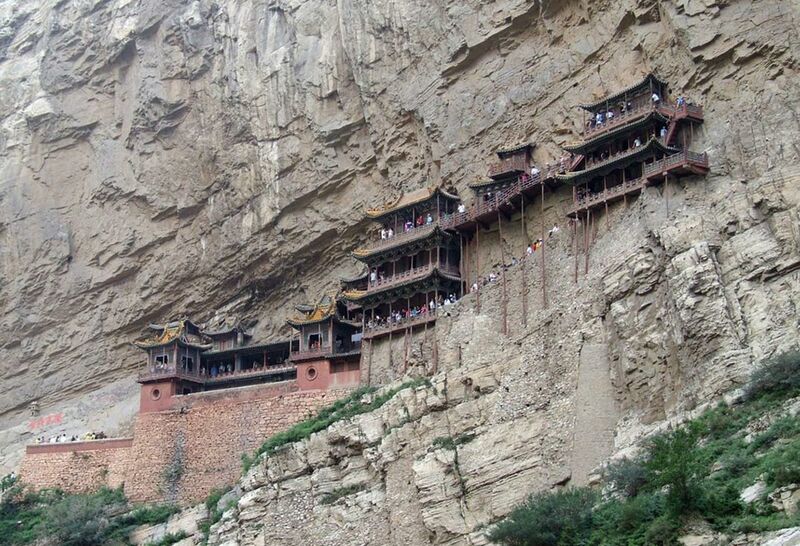 Its seemingly impossible engineering alone has attracted numerous people to see the Hanging Monastery for themselves. Others are perhaps inspired by the co-existence of Buddhism, Taoism and Confucianism. 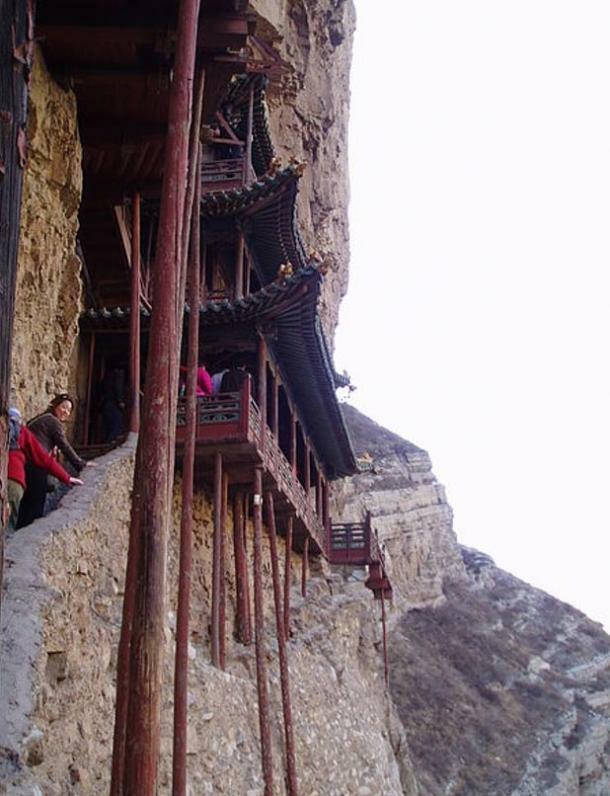 Nevertheless, the precarious position of the structure is certain to cause some to think twice before visiting the Hanging Monastery, and a trip there is certainly not for the faint of heart. 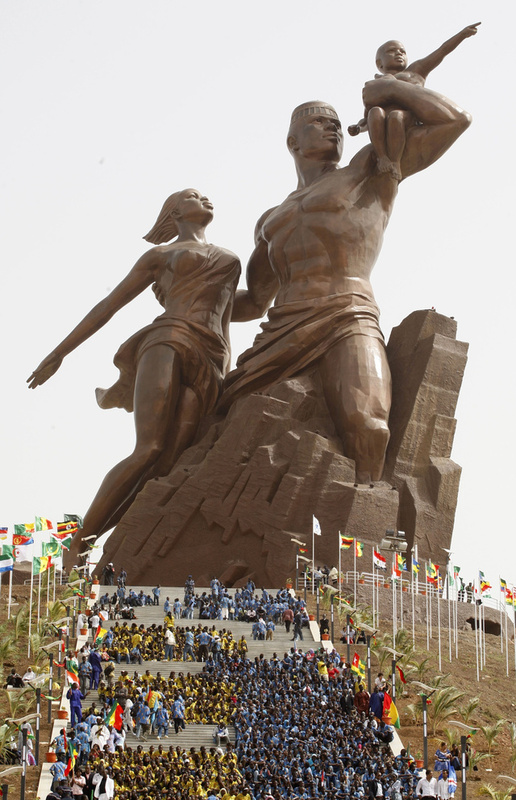 They’re the very definition of monumental. 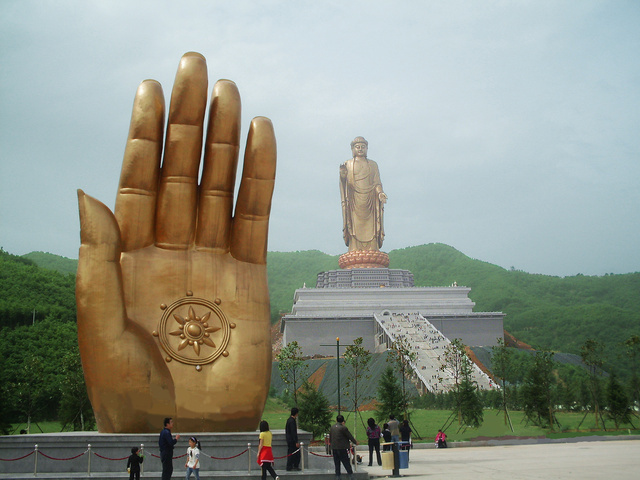 These sculptures are the most enormous you’ll ever see in the world. They’re both insane and utterly magnificent. 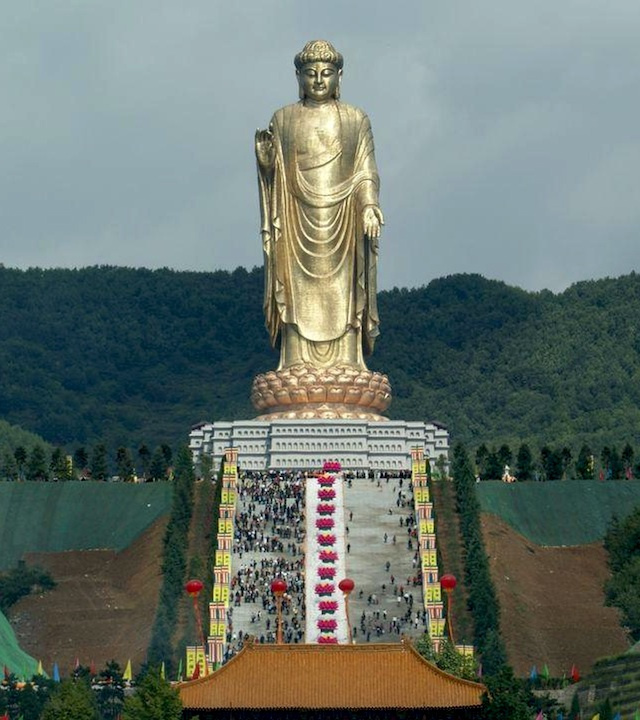 The 420 ft or 128 m (including its 66 ft or 20 m high lotus throne) tall Spring Temple Buddha in the Fodushan Scenic Area, Zhaocun, China, built in 2002. 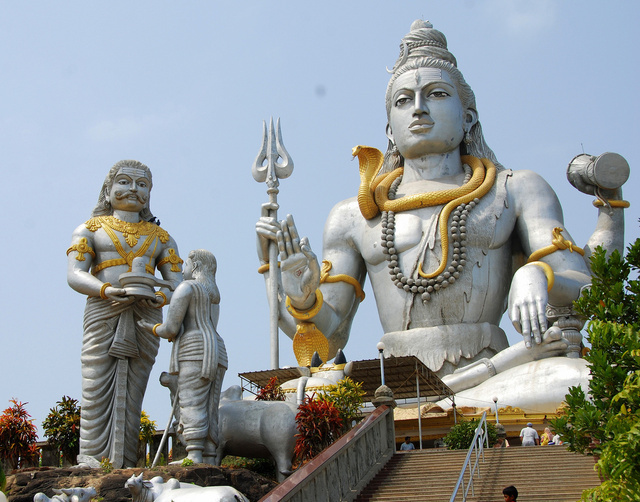 The statue looks even taller because of the three pedestals added few years after its completion. 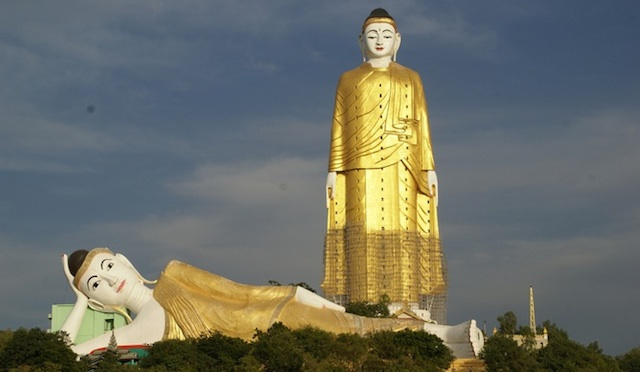 The total height of the complex is now 682 ft or 208 m.
The Laykyun Setkyar, a standing Buddha statue on a 44 ft (13.5 m) throne, Khatakan Taung, Myanmar. Built by Chief Abbot Ven. Nãradã, constructed between 1996 and 2008. 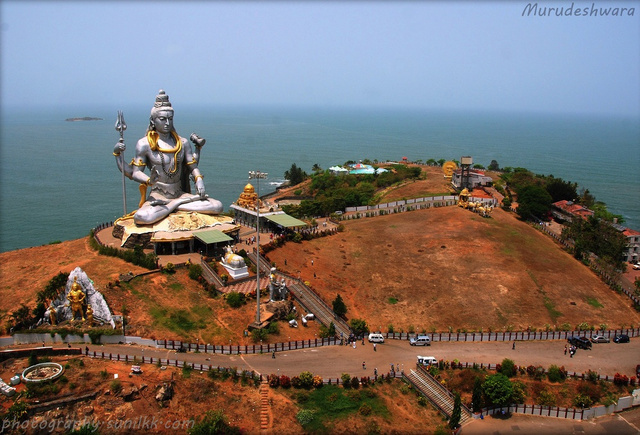 The statue has a height of 381 ft (116 m). There is a smaller reclining Buddha right in front of the standing one, and there are thousands of Buddhism-themed painting and small sculptures inside the big one and around the complex. 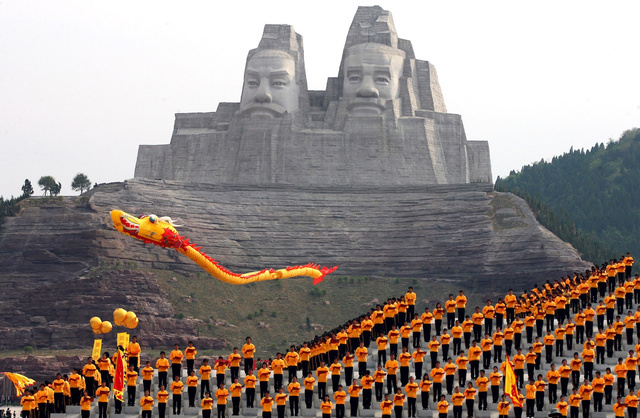 The giant, 348 ft (106 m) high mythical emperors Yan and Huang in Zhengzhou, China, constructed for two decades, completed in 2007. 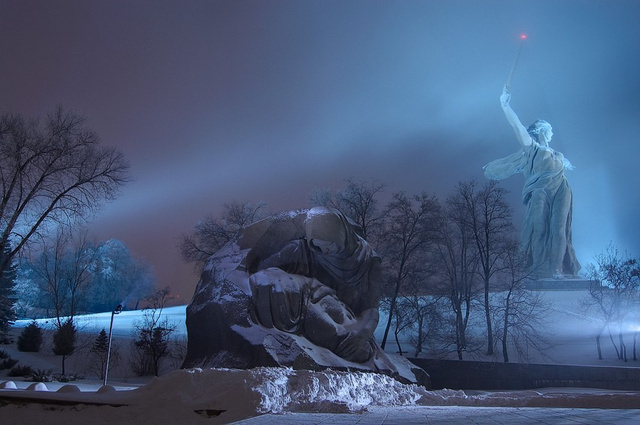 Peter the Great statue, a 315 ft (96 m) high monument designed by Zurab Tsereteli, erected in 1997. 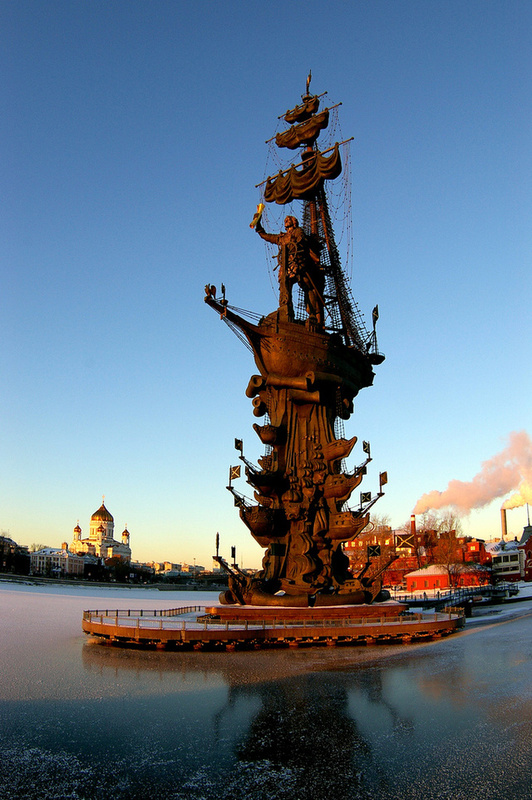 Peter started out as an idea for a statue of Christopher Columbus that Tsereteli pitched to U.S. cities in 1992 in remembrance of the great voyage 500 years earlier. Over the years, Baltimore, New York and others – even Columbus, Ohio – turned him down, and Tsereteli eventually persuaded Puerto Rico to accept his model. Meanwhile, he busied himself designing Peter, who looked very much like Columbus, but with a different head. The 200 steps from the bottom of the hill to the monument are symbolizing the 200 days of the battle. 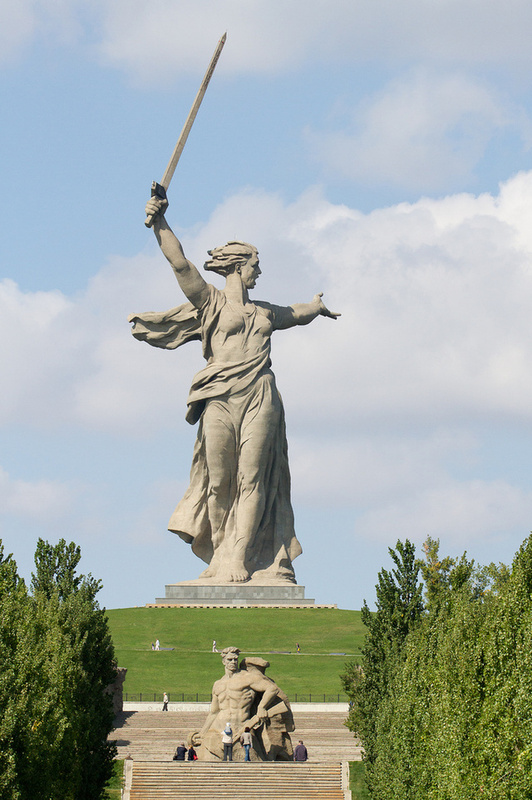 The figure itself measures 170 ft (52 m) and has a 108 ft (33 m) long sword. 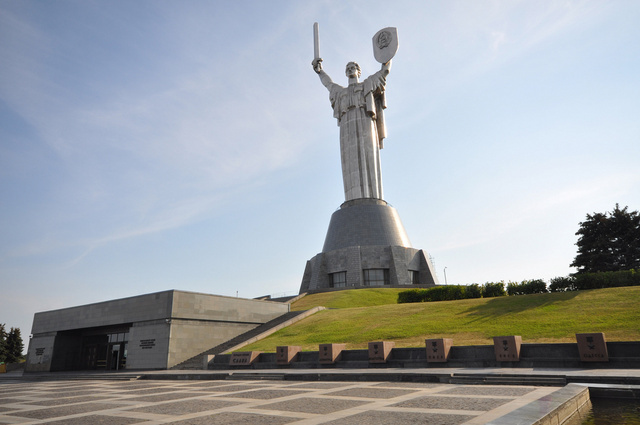 Mother of the Motherland, a part of Museum of the Great Patriotic War in Kiev, Ukraine, built between 1979 and 1981. 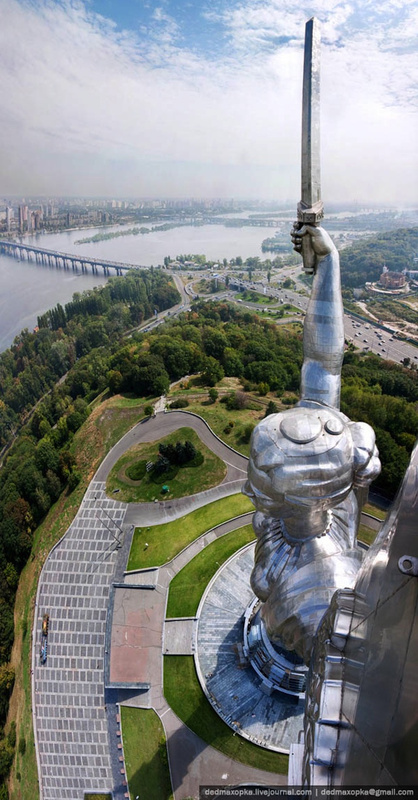 The 203 ft (62 m) tall stainless steel statue with a 52 ft (16 m) long sword and a 43 by 26 ft (13 by 8 m) shield with the State Emblem of the Soviet Union was designed by Yevgeny Vuchetich and stands upon a 131 ft (40 m) high museum building. Its total height is 335 ft (102 m). 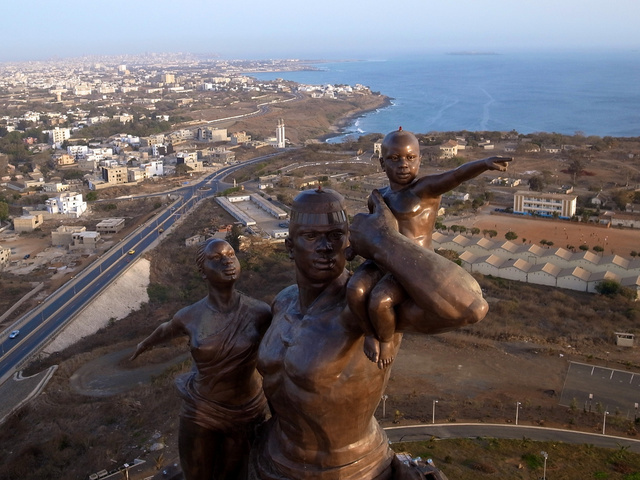 The 160 ft (49 m) tall African Renaissance Monument, a bronze statue outside of Dakar, Senegal, designed by the Senegalese Pierre Goudiaby, constructed by the North Korea-based Mansudae Overseas Projects between 2008 and 2010. 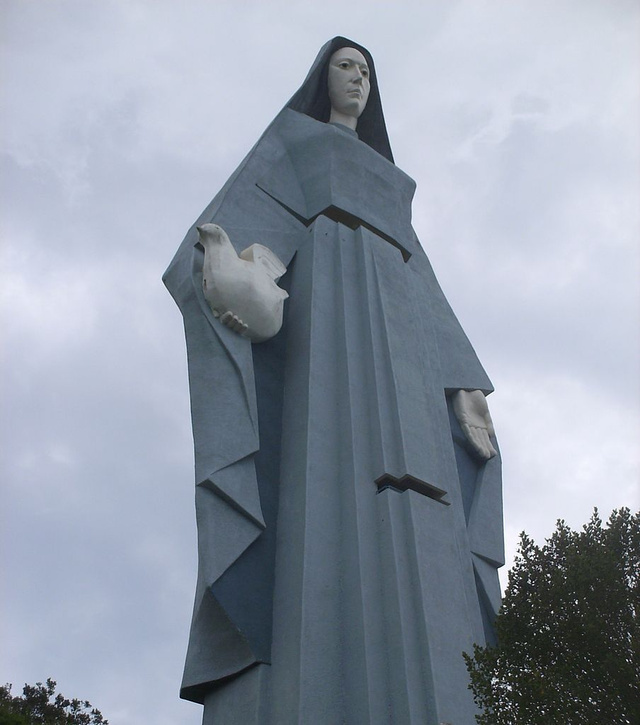 The tallest sculpture of the Virgin Mary in the world in Trujillo, Venezuela. It’s 153 ft (46.7 m) high and sculpted by Manuel de la Fuente in 1983. 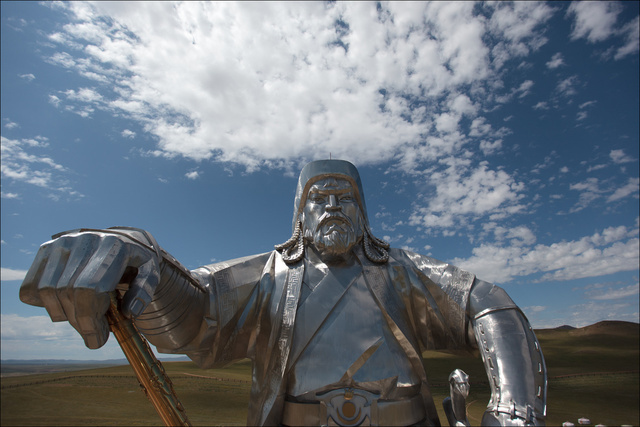 It’s on the top of a visitor centre with 36 columns representing the 36 khans of the Borjigin clan who ruled the Mongols from Chakhar. 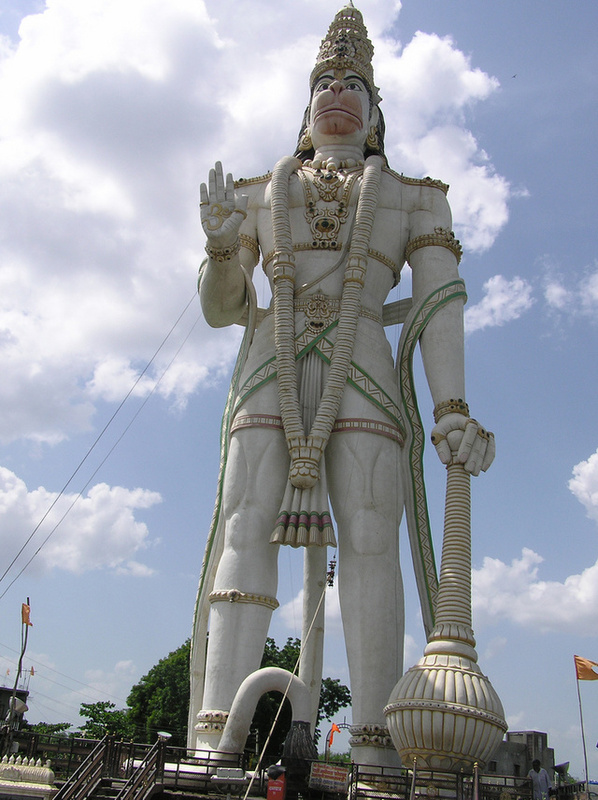 Lord Hanuman was one of the Vānaras, a group of monkey-like shapeshifter humanoids with supernatural powers in the Hindu epic Ramayana. 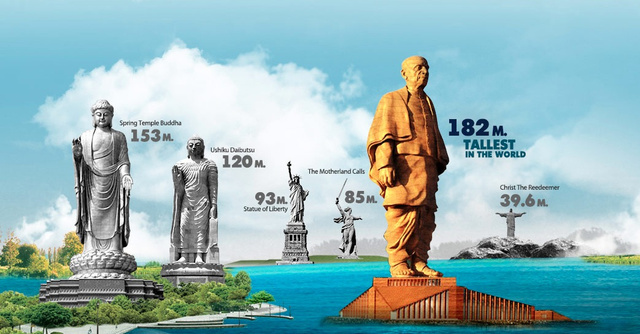 Bonus: India wants to build the world’s tallest statue, the Statue of Unity. 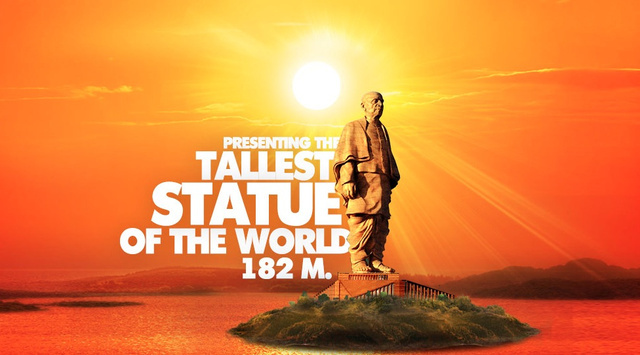 It will be a 597 feet (182 m, without base) tall tribute to Sardar Patel. Sardar Vallabhbhai Patel (or just Sardar, which means Chief) was the first Home Minister (the head of the Ministry of Home Affairs) and Deputy Prime Minister of post-independence India from 15 August 1947 to his death in December 15,1950. The foundation stone of the 790 ft high statue (240 metros, with base) was laid on Sardar’s birthday on the 31st of October, three weeks ago, according to the International Business Times. The St. Naum monastery in Macedonia is located on the shore of Lake Ohrid, close to the Albanian border. It was named after its founder and one of the most respected and well-known saints in Bulgaria and Macedonia. Life and work of St. Naum, which was a historical person, is described in several literary works. This church is one of the ascetic of the founders of the Bulgarian religious literature. In addition, there is a legend that says that St. Naum had the gift of healing the sick. Macedonians believe that ear to the sarcophagus with the relics of the ascetic, and now you can hear the beating of his heart. The St. Naum monastery founded in 905. The architectural design of the building, as far as it was able to recreate the excavations, quite unusual. The monastery was designed as a shamrock. There are no accurate data on the time of destruction of the building, but, apparently, this was before the arrival of the Turks in Macedonia. 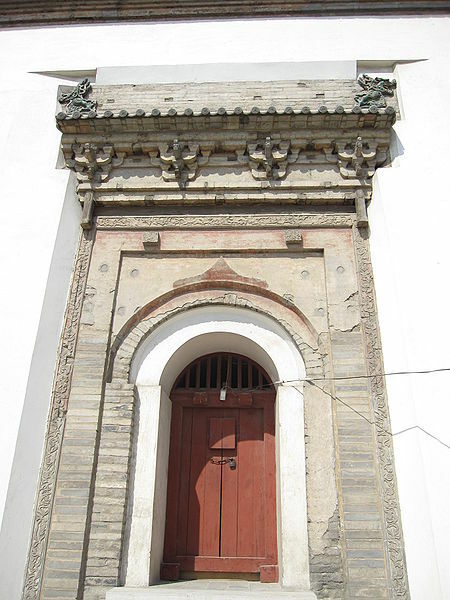 The existing church was rebuilt in the XVI century during the Ottoman period. The building itself is transformed, acquired from the cross-shaped structure with a dome. And while in 1875 due to the strong fire much of the building burned to the ground, the monastery still survives in this form. The relics of St. Naum buried in a private room in the southern part of the monastery. Numerous frescoes and ancient church decorations have not survived to our time, but there are pictures in the convent, dating from the beginning of the tenth century. Gone are the days of kings and queens ruling the populace from on high (in most of the world, anyway). But while many monarchs have fallen, their palaces remain as permanent — and beautiful — testaments to their rulers’ transient power. From the fairy-tale spires of German castles to the delicate wooden eaves of Japanese feudal strongholds, these royal dwellings have prevailed long after their original residents abandoned them. We’ve rounded up 10 inspiring castles that captivate travelers with their stunning architecture and fascinating royal histories. From its perch atop al-Sabika hill in Granada (about 260 miles south of Madrid), the Alhambra served as an ideal military fortress thanks to its isolated location and coveted views of the surrounding area. The palace didn’t become a true royal residence until Muhammed I, the first sultan of the Nasrid Dynasty, arrived in the 13th century. As new sultans came and went, the Alhambra continued to grow. Yusuf I built the Justice Tower in 1348 to serve as the castle’s grand arched gateway. Yusuf’s successor, Muhammed V, commissioned the Patio of the Lions, which is still famed today for its lion-shaped fountain and Islamic architecture. However, Muslim rule in southern Spain faded quickly. In 1492, Sultan Muhammed XII surrendered the Alhambra to Spanish King Ferdinand II and Queen Isabella I. Charles V, the Holy Roman Emperor (and Ferdinand and Isabella’s grandson), began a renovation of the Alhambra in 1527. But the older designs still shine through, especially in the Hall of the Moors with its carved ceiling and elegant cupola. Built in 1504 during the Sengoku (Japan’s civil war period), Matsumoto Castle was originally designed as a small fortress. It wasn’t until Japan’s unification under the Tokugawa shogunate in the early 17th century that Matsumoto Castle was refashioned into the three-turreted structure we see today. Matsumoto was built to withstand enemy attack, but by the time it was assembled around 1595, Japan’s wars were drawing to a close. 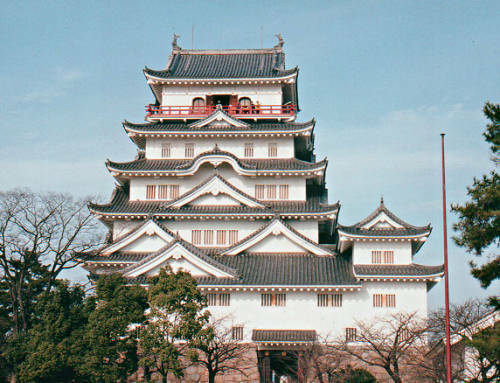 Matsumoto was never attacked, which is probably why its 95-foot-tall tower is Japan’s longest-standing inner tower. 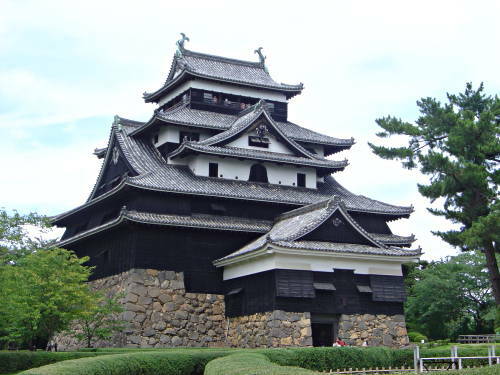 Visitors to Matsumoto — which sits about 44 miles southwest of Nagano in central Japan — can marvel at the castle’s black walls and swooping, tiered eaves that earned it the nickname Crow Castle (Karasu-jo in Japanese). Plus, a peek out the fifth- or sixth-floor windows affords sweeping vistas of the surrounding mountains. Meanwhile, the landscaped grounds below burst with gorgeous cherry, azalea and wisteria blossoms in the spring. When French King Louis XIII originally established Château de Versailles in 1631, it was just a hunting lodge situated about 15 miles west of Paris. It was his son, King Louis XIV, who expanded Versailles into a sprawling palace complex between 1661 and 1710. Each king who lived at Versailles added his own personal touch to the palace. In the 1670s, Louis XIV installed the resplendent Hall of Mirrors, with its intricate glasswork and chandeliers. And in 1774, Louis XVI gave his wife Marie Antoinette an expansive private estate, tucked away in Versailles’ lush gardens. The French monarchy remained at Versailles until 1789, when an uprising connected to the French Revolution forced the regents to flee to Paris. In the years that followed the Revolution, Versailles served many purposes, acting as a lavish retreat for Napoleon Bonaparte, a French history museum (opened by King Louis-Philippe in 1837) and the staging ground for the Treaty of Versailles. Today, the palace is one of France’s top tourist sites, luring millions of visitors each year. When he commissioned this architectural wonder for his wife, Catherine I, in 1717, Russian Tsar Peter the Great envisioned Catherine Palace to be a modest, two-story affair. However, visitors to this enormous blue, white and gold structure in Pushkin (situated about 20 miles south of St. Petersburg) will tell you there is nothing modest about it. That’s because Peter’s daughter, Empress Elizabeth of Russia, had the entire palace redesigned in 1743 in an effort to create a structure extravagant enough to rival Versailles. The result: a 1,066-foot-long Rococo-style fortress featuring a stucco facade gilded with more than 220 pounds of gold. The palace’s interior is just as grand. Its Great Hall, or Hall of Light, comprises nearly 10,764 square feet. Meanwhile, the palace’s famous Amber Room that was once adorned with nearly 12,000 pounds of amber gems. When Empress Elizabeth’s niece, Catherine II (Catherine the Great), ascended the Russian throne in 1762, she remodeled the palace once again. Catherine found her aunt’s tastes to be outdated, referring to the palace’s showy flourishes as “whipped cream.” Catherine II implemented the less-gaudy Classical style, which is best exhibited in the symmetrical lines of the Green Dining Room and the Blue Drawing Room. Commissioned in 1868, Neuschwanstein Castle was built to serve as German King Ludwig II’s secluded Bavarian retreat. However, on the eve of the king’s mysterious death nearly 18 years after the first brick of his domicile was laid, the mountaintop castle was far from completion — much of it was still shrouded in scaffolding. Construction on Neuschwanstein continued until 1892, though the architect simplified many of Ludwig’s more ambitious designs. But the castle is far from simplistic: The Romanesque Revival spires and turrets seem as though they were lifted directly from a fairy tale. (In fact, Neuschwanstein inspired Sleeping Beauty’s Castle at Disneyland.) Nowadays, Neuschwanstein Castle welcomes 1.4 million visitors a year, many of whom make the roughly 75-mile drive southwest from Munich to wander its halls. In 1799, Indian Maharaja Sawai Pratap Singh had the Hawa Mahal built in Jaipur so that the women in his court could have a clandestine spot to admire the festivities in the market square below. (In those days, royal Indian women observed Purdah, which forbade them from going out in public or being seen by strangers.) The red and pink-hued sandstone edifice’s name translates to “The Palace of the Winds,” which refers to the westward breezes that blow across the 593 windows gracing the palace’s latticed facade. Today, the palace isn’t restricted to royal ladies: Tourists can peer through the palace’s famous windows, soak up the breathtaking views of the city from the top and explore the small royal museum within. However, the best views of the palace are still from street level — sunrise bathes the front wall of the palace in golden light from the rising sun, so plan on arriving early if you’re looking to capture stunning photos. Beginning in 1919, newspaper and publishing magnate William Randolph Hearst began laying the groundwork for his dream home atop a hill in San Simeon, Calif., about 100 miles south of Monterey. Although it was never officially completed (Hearst had to leave the property in 1947 because of health problems), Hearst Castle stands as a 165-room icon of American entrepreneurship and wealth. The mansion — and its three spacious adjacent “cottages” — served as Hearst’s playground, where he entertained numerous members of the Hollywood elite, among other guests. The state of California now owns the property, and visitors to San Simeon can take daily tours. “Cottage & Kitchen” tours cover Hearst’s two outdoor swimming pools, tickets to Hearst Castle Theater and a viewing of Hearst’s enormous wine cellar. 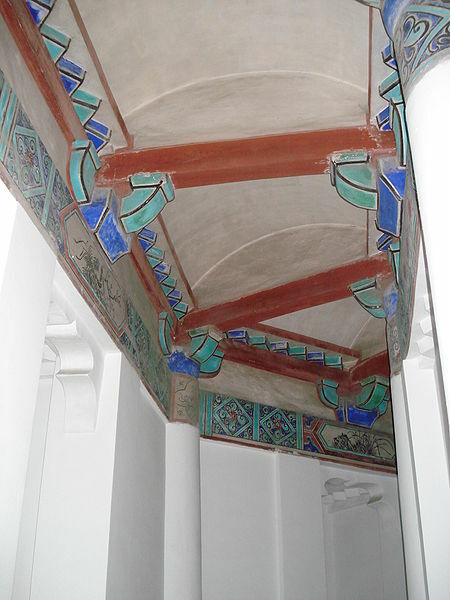 Visitors can also learn about the mélange of architecture styles the mansion features, including Spanish, Italian, Moorish and French detailing. And art history buffs will want to check out the Hearst Castle’s collection of fine art, which includes Antonio Canova’s The Three Graces statue and a marble sarcophagus depicting the nine muses that dates back to the 3rd century A.D. When King Rama I seized power of Siam in 1782, he set to work building a palace in central Bangkok that would serve as the official residence of Chakri Dynasty kings. Although the current King Rama IX no longer lives here (and all government offices moved elsewhere after the Siamese Revolution of 1932), the Grand Palace still stands as one of Bangkok’s most visited — and most picturesque — landmarks. Visitors to the Grand Palace can snap photos of the glittering gold spires and other impressive gilded structures. Perhaps the most remarkable feature is Wat Phra Kaew, or the Emerald Buddha Temple, which is named for the green Buddha statue on top of its gold altar (though the Buddha is actually made of jadeite, not emeralds). Further along, visitors will see Rama I’s library with its mother-of-pearl doors and the Buddhist texts within. And throughout the tour, you’ll notice an eclectic mix of architecture and building techniques, including Asian styles like Ayutthaya, Sri Lankan and Thai, as well as Western influences from England, Italy and France. The elaborate Château de Chambord, located in the French countryside about 111 miles south of Paris, was never designed for sensible living. The heating and upkeep of the castle alone were so arduous that the French royal family only spent summers and short retreats here; the structure and grounds were used mainly for hunting and entertainment purposes. What Château de Chambord lacks in practicality, though, it makes up for in stunning architecture. King François I began building the Château in 1519; the palace features a magnificent — and baffling — double spiral staircase, which allows one person to ascend and another to descend without meeting each other on the way (some speculate that the Château and its staircase were designed by Leonardo da Vinci, who was under the king’s patronage at the time). Outside, Château de Chambord’s roof is a marvel in itself, with intricate turrets and cupolas reminiscent of an Italian city skyline. While visitors today can behold Château de Chambord’s architectural wonders, textile lovers might be disappointed; all of the palace’s original furniture was stolen during the French Revolution. Although built in the Norman style (a combination of Romanesque and Gothic architecture from the 12th century), Washington D.C.’s Smithsonian Castle was finished as recently as 1855. The sandstone building became the foundation of the Smithsonian Institution’s museums, of which there are now 20 around D.C. and in New York (including the National Zoo). But back in 1855, the castle stood alone on a plot of downtown D.C. earth that was to become the National Mall. The castle’s east wing housed Joseph Henry, the first Secretary of the Smithsonian, along with his wife and three daughters. And since none of the Smithsonian museums had been constructed yet, the Smithsonian’s collections also called the castle home. It wasn’t until 1881, with the erection of the U.S. National Museum (now called the Arts and Industries Building) next door, that the Smithsonian’s arts and sciences collections began to expand. Today, the castle accommodates the Smithsonian Institution’s administrative offices — but the castle’s bureaucratic status doesn’t make it any less beautiful. Those traveling to Washington, D.C. can admire the Smithsonian Castle’s red towers, turrets and arches from the National Mall. Venture inside to see the castle’s tall windows and skylights in action, as they flood the lecture halls and galleries with ample natural light. From Wikipedia, the free encyclopedia and others. 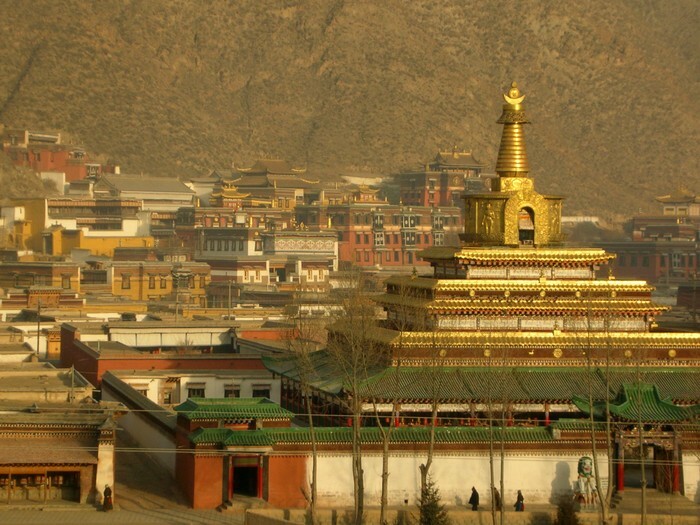 Labrang Monastery (Tibetan: Wylie: bla-brang bkra-shis-’khyil; Chinese: 拉卜楞寺 Pinyin: lābǔlèng sì) is one of the six great monasteries of the Geluk (Yellow Hat) school of Tibetan Buddhism. Its formal name is: Gandan Shaydrup Dargay Tashi Gyaysu Khyilway Ling (dGe ldan bshad sgrub dar rgyas bkra shis gyas su ‘khyil ba’i gling), commonly known as Labrang Tashi Khyil, or simply Labrang. 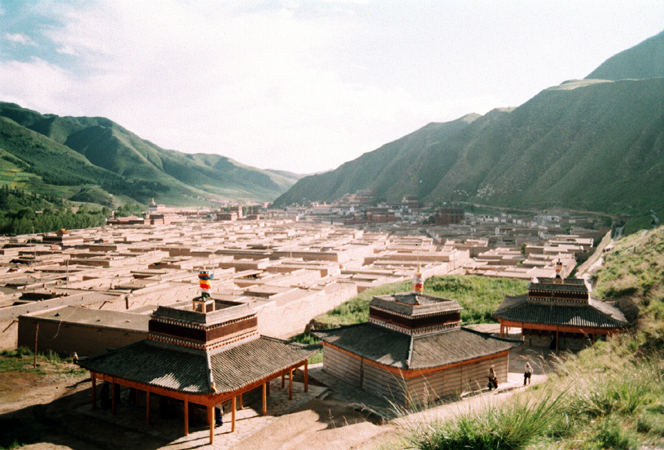 Labrang is located in Xiahe County in Gansu province, in the traditional Tibetan area of Amdo. 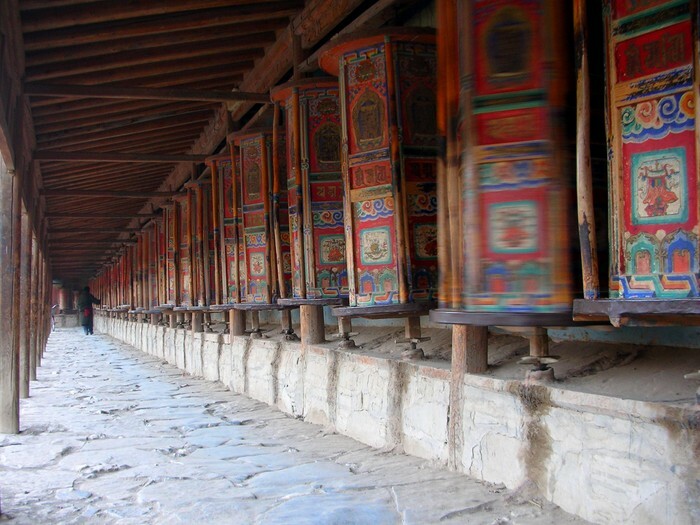 Labrang Monastery is home to the largest number of monks outside of Tibet Autonomous Region. Xiahe is located about 4 hours from the city of Lanzhou, the capital of Gansu. In the early part of the 20th century, Labrang was by far the largest and most influential monastery in Amdo. It is located on the Sangchu or Xiahe River a tributary of the Huang He or Yellow River. Labrang Monastery is located in the town of Xiahe, which belongs to the Gannan Tibetan Autonomous Prefecture. 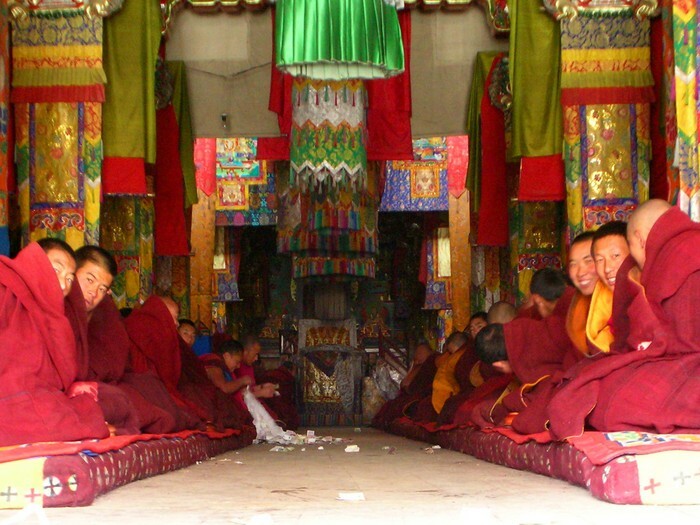 The monastery was founded in 1709 by the first Jamyang Zhaypa, Ngawang Tsondru. 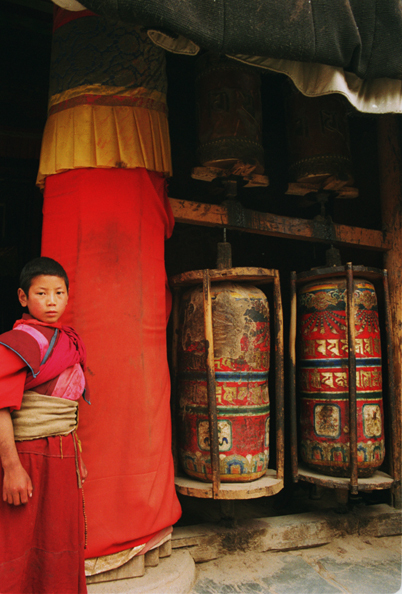 It is Tibetan Buddhism’s most important monastery town outside the Tibetan Autonomous Region. Labrang Monastery is situated at the strategic intersection of four major Asian cultures—Tibetan, Mongolian, Han Chinese, and Chinese Muslim—was one of the largest Buddhist monastic universities. In the early 20th century, it housed several thousand monks. 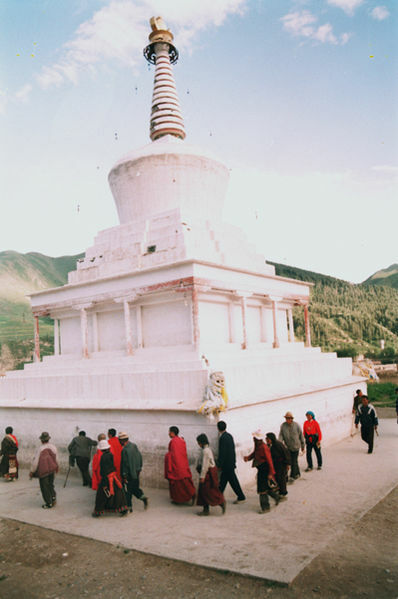 Labrang was also a gathering point for numerous annual religious festivals, supported an active regional marketplace where Han Chinese artisans rubbed shoulders with Hui merchants and nomadic Tibetan highlanders, and was the seat of a Tibetan power base that strove to maintain regional autonomy through the shifting alliances and bloody conflicts that took place between 1700 and 1950. In April 1985 the Assembly Hall burned down. It was replaced and the new building was consecrated in 1990. The monastery complex dominates the northern part of the village. 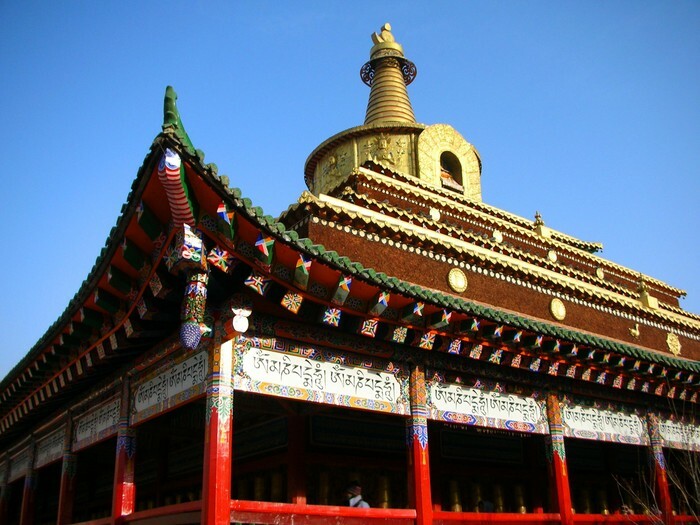 The white walls and golden roofs feature a blend of Tibetan and Han architectural styles. The monastery contains 18 halls, six institutes of learning, a golden stupa, a sutra debate area, and houses nearly 60,000 sutras. There once were more than 2,000 monks in residence, but now only 500, due to a twelve year closure starting in 1958. 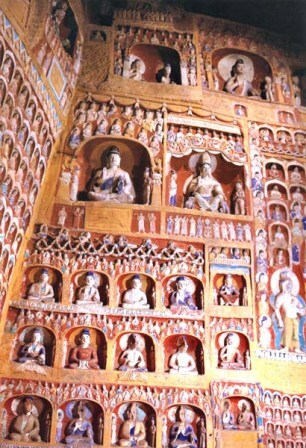 It has a Buddhist museum with a large collection of Buddha statues, sutras and murals. In addition, a large amount of Tibetan language books, including books on history is available for purchase, together with medicines, calendars, music and art objects. 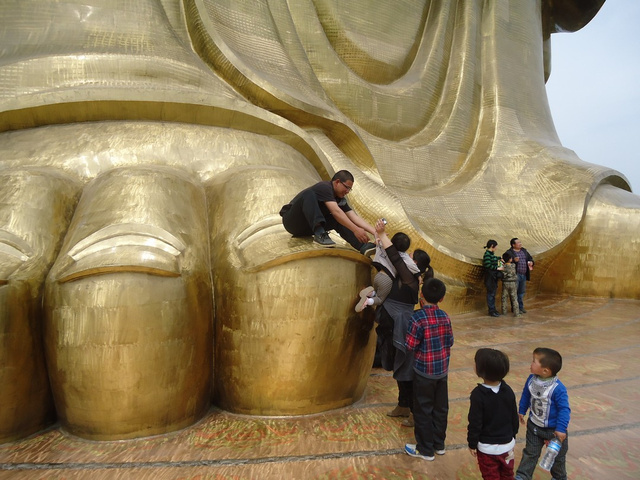 There used to be a great golden statue of the Buddha, more than 50 feet high, which was surrounded by rows of surrounding Buddhas in niches. 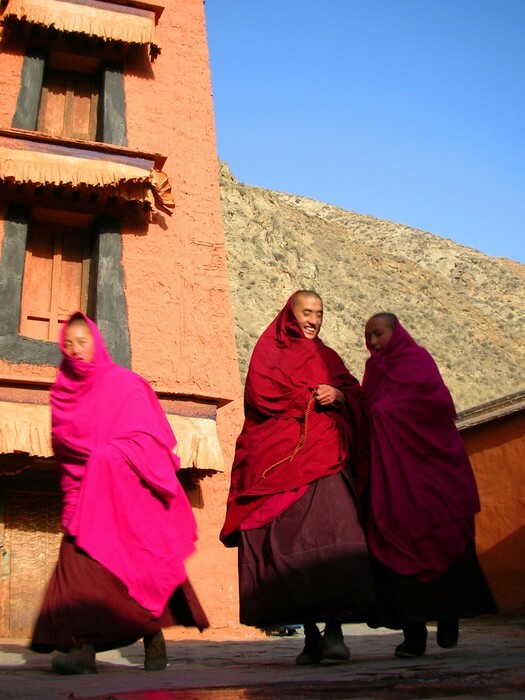 The monastery today is an important place for Buddhist ceremonies and activities. From January 4 to 17 and June 26, to July 15, (these dates may change according to the lunar calendar), the great Buddhist ceremony will be held with Buddha-unfolding, sutraenchanting, praying, sutra debates, etc. The Chinese Muslim Ma Clique under Generals Ma Qi and Ma Bufang launched several attacks against Labrang as part of a general anti Tibetan campaign. 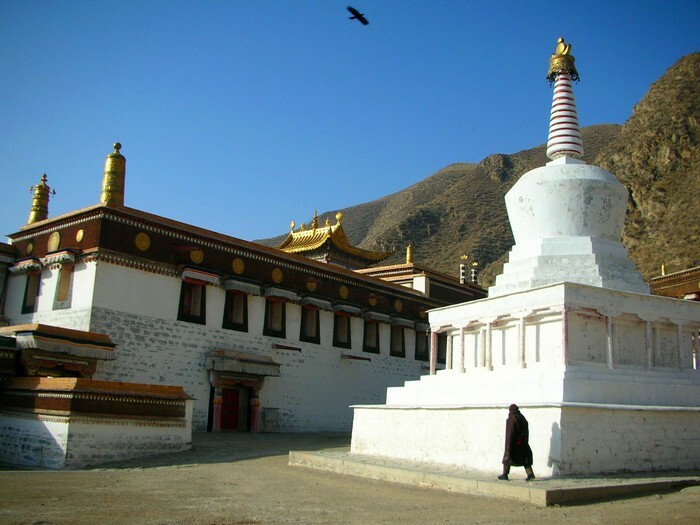 Ma Qi occupied Labrang monastery in 1917, the first time non-Tibetans had seized it. Ma Qi defeated the Tibetan forces with his Hui Chinese troops. 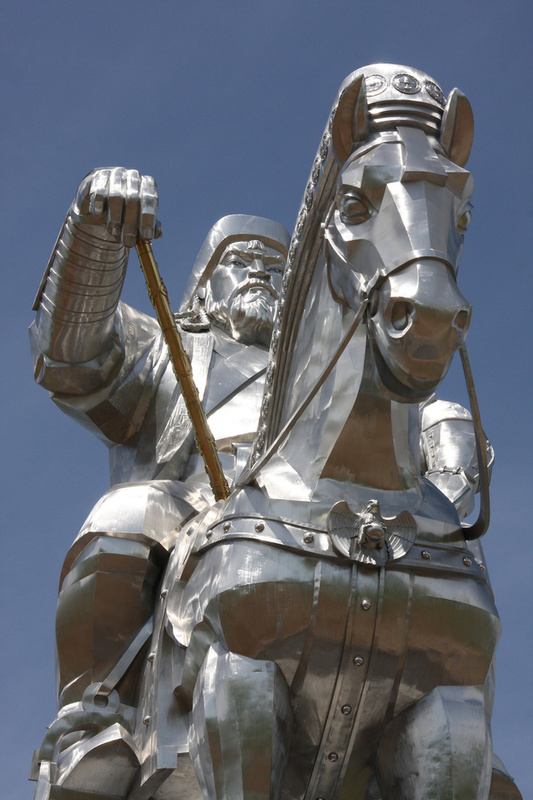 His forces were praised by foreigners who traveled through Qinghai for their fighting abilities. After ethnic rioting between Hui and Tibetans emerged in 1918, Ma Qi defeated the Tibetans. He heavily taxed the town for 8 years. In 1925, a Tibetan rebellion broke out, with thousands of Tibetans driving out the Hui. Ma Qi responded with 3,000 Hui Chinese troops, who retook Labrang and machine gunned thousands of Tibetan monks as they tried to flee. During a 1919 attack by Muslim forces, monks were executed by burning. Bodies were left strewn around Labrang by the Hui troops. 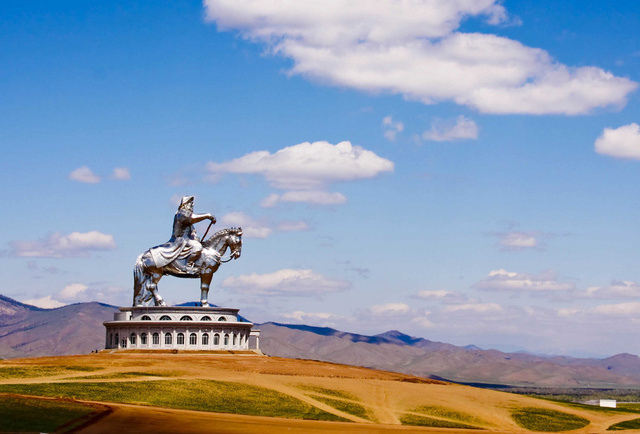 Ma Qi besieged Labrang numerous times, the Tibetans and Mongols fought against his Hui forces for control of Labrang, until Ma Qi gave it up in 1927.However, that was not the last Labrang saw of General Ma. Ma Qi launched a genocidal war against the TibetanNgoloks, in 1928, inflicting a defeat upon them and seizing the Labrang Buddhist monastery.The Hui forces looted and ravaged the monastery again. The Austrian American explorer Joseph Rock encountered the aftermath of one of the Ma clique’s campaigns against Labrang. The Ma Muslim army left Tibetan skeletons scattered over a wide area, and the Labrang monastery was decorated with decapitated Tibetan heads. After the 1929 battle of Xiahe near Labrang, decapitated Tibetan heads were used as ornaments by Chinese Muslim troops in their camp, 154 in total. Rock described “young girls and children”‘s heads staked around the military encampment. Ten to fifteen heads were fastened to the saddle of every Muslim cavalryman. The heads were “strung about the walls of the Moslem garrison like a garland of flowers. In March 2008 there were protests by monks from Labrang Monastery as well as by other ethnic Tibetans linked to previous protests and rioting that broke out in Lhasa. 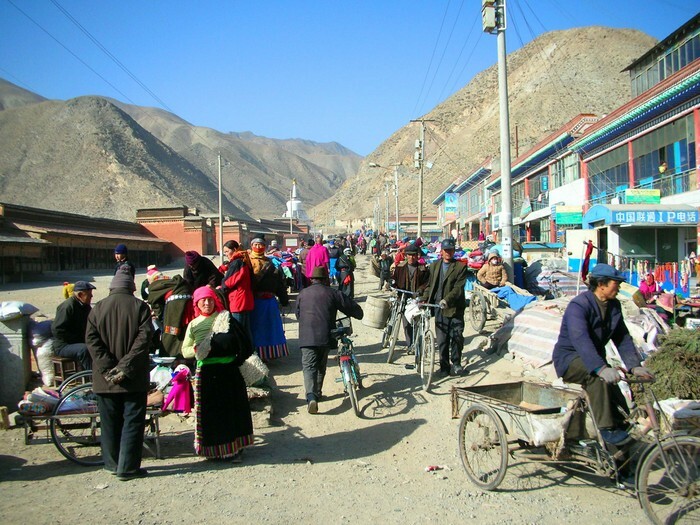 The outdoor market just outside of Labrang’s main entrance shows a wide variety of Xiahe’s inhabitants. 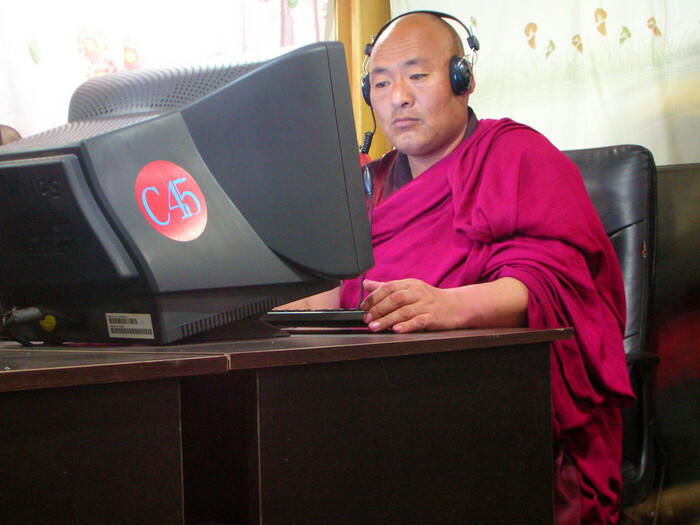 A monk video-conferencing with a friend in one of Xiahe’s suprisingly high-quality Internet cafes. A remarkable new set of images from Labrang today depict the self-immolation of Dorje Rinchen and its aftermath, showing the Tibetan farmer running down the street ablaze, and a buildup of troops in confrontation with local people trying to protect Dorje Rinchen. The self-immolation of Dorje Rinchen has been confirmed by the Chinese state media today (October 23) and is the second self-immolation at Labrang in eastern Tibet in two days. Dorje Rinchen ablaze after he set fire to himself today (October 23). Dorje Rinchen collapses to the ground in Labrang. Troops are seen closing in on Dorje Rinchen’s body after he has self-immolated. Smoke can still be seen arising from his body and it is not clear if he was still alive at this point. Laypeople and monks are trying to protect him from being taken away by troops. 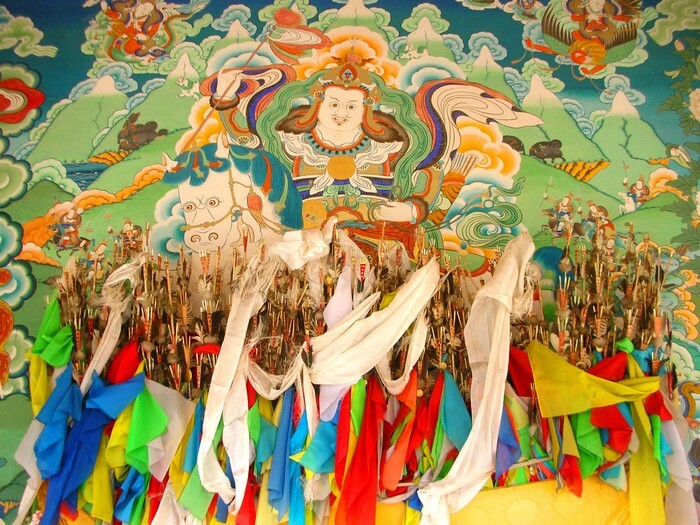 In Tibetan tradition, it is important to protect the body of someone who has died for religious ritual and offerings in order to ensure an auspicious rebirth. Since the self-immolations began in Tibet in 2009, many Tibetans have taken great risks to retrieve the bodies of those who have self-immolated in order to carry out religious practice. Armed police in riot gear block a road near the site of the self-immolation. The Porcelain Tower (or Porcelain Pagoda) of Nanjing (Chinese: 南京陶塔; pinyin: Nánjīng Táotǎ), also known as Bao’ensi (meaning “Temple of Gratitude”; Chinese: 大报恩寺, Da Bao’en Si), is a historical site located on the south bank of the Yangtze in Nanjing, China. It was a pagoda constructed in the 15th century during the Ming Dynasty, but was mostly destroyed in the 19th century during the course of the Taiping Rebellion. The tower is now under reconstruction. The tower was octagonal with a base of about 97 feet (30 m) in diameter. When it was built, the tower was one of the largest buildings in China, rising up to a height of 260 feet (79 m) with nine stories and a staircase in the middle of the pagoda, which spiraled upwards for 184 steps. The top of the roof was marked by a golden pineapple. There were originally plans to add more stories, according to an American missionary who in 1852 visited Nanjing. 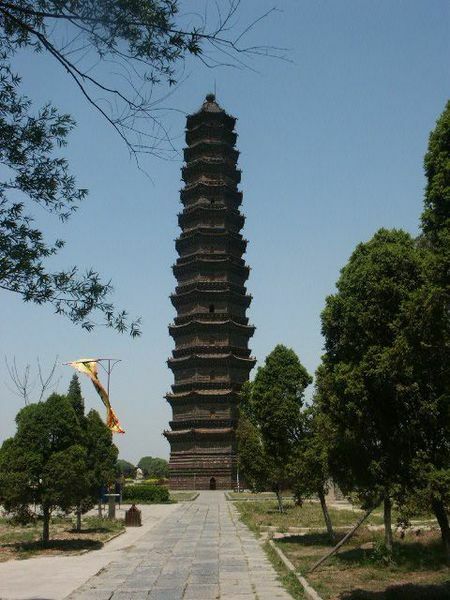 There are only a few Chinese pagodas that surpass its height, such as the still existent 275-foot-tall (84 m) 11th-century Liaodi Pagoda in Hebei or the no longer existent 330-foot-tall (100 m) 7th-century wooden pagoda of Chang’an. The tower was built with white porcelain bricks that were said to reflect the sun’s rays during the day, and at night as many as 140 lamps were hung from the building to illuminate the tower. Glazes and stoneware were worked into the porcelain and created a mixture of green, yellow, brown and white designs on the sides of the tower, including animals, flowers and landscapes. 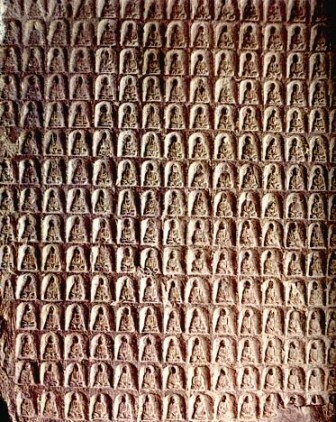 The tower was also decorated with numerous Buddhist images. The Porcelain Tower of Nanjing was designed during reign of the Yongle Emperor (r. 1402-1424) shortly before its construction, in the early 15th century. It was first discovered by the Western world when European travelers like Johan Nieuhof visited it, sometimes listing it as one of the Seven Wonders of the World. After this exposure to the outside world, the tower was seen as a national treasure to both locals and other cultures around the world. In 1801, the tower was struck by lightning and the top three stories were knocked off, but it was soon restored. The 1843 book The Closing Events of the Campaign in China by Granville Gower Loch contains a detailed description of the tower as it existed in the early 1840s. In the 1850s, the area surrounding the tower erupted in civil war as the Taiping Rebellion reached Nanjing and the Taiping Rebels took over the city. They smashed the Buddhist images and destroyed the inner staircase to deny the Qing enemy an observation platform. American sailors reached the city in May 1854 and visited the hollowed tower. In 1856, the Taiping destroyed the tower in order to prevent a hostile faction from using it to observe and shell the city. After this point, the tower’s remnants were forgotten and it lay dormant until a recent surge to try and rebuild the landmark. Pizhi Pagoda, 54 m (177 ft) in height, built by 1063. 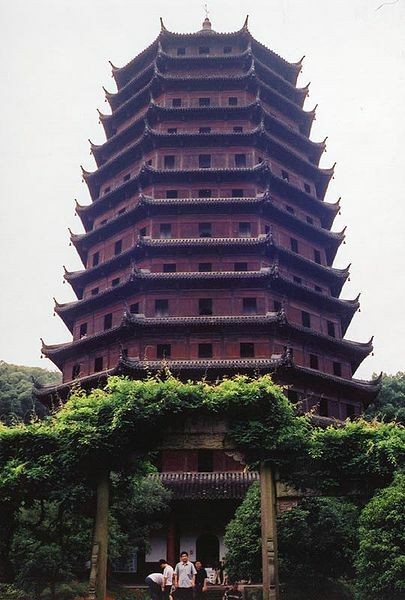 The Pizhi Pagoda (Chinese: 辟支塔; pinyin: Pìzhī Tǎ) is an 11th century Chinese pagoda located at Lingyan Temple, Changqing, near Jinan, Shandong province, China. Although originally built in 753 during the reign of Emperor Xuanzong of Tang (r. 712–756), the present pagoda is a Song Dynasty reconstruction from 1056 until 1063, during the last reigning years of Emperor Renzong of Song (r. 1022–1063). This octagonal-based, nine-story tall, brick-and-stone pagoda stands at a height of 54 m (177 ft). The Chinese word “pizhi” is a translation of the Sanskrit word pratyeka. The pratyeka is a type of buddha, a loner personality and one who has attained enlightenment after the death of the Sakyamuni Buddha. This is achieved by self-study and self-cultivation without the aid of Buddhist teachers or guides. Thus, the Pizhi Pagoda was built by the Song Chinese of the 11th century in dedication of these pratyeka, which is a rarity among pagodas in China. From a cliffside of nearby Mount Tai, a view onto Lingyan Temple and Pizhi Pagoda. The basic structure of the pagoda is built of brick, although the exterior facade has carved stone elements. At the base of the pagoda is a stone pedestal carved on four sides with scenes of the Buddhist afterlife and torture scenes in Hell. The first, second, and third stories feature balconies supported by typical Chinese dougong brackets. From the fourth story until the ninth, there are only pent roofs and no balconies. The iron steeple crowning the top of the pagoda is composed of an inverted bowl, discs, a sun, a crescent, and a bead. Iron chains are used to keep the steeple firmly into place on the rooftop. 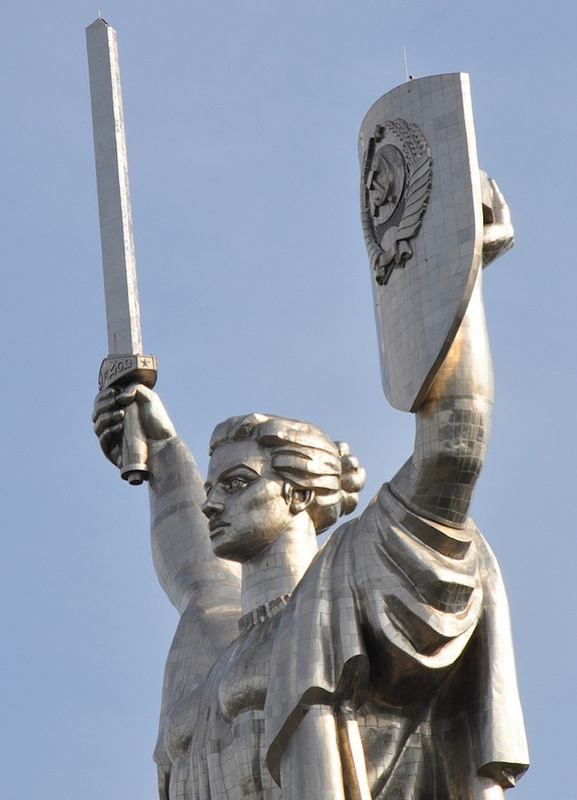 Small iron statues of celestial guards were positioned on the corner ridges by each of the chains, which was believed to keep the chains firmly into place. 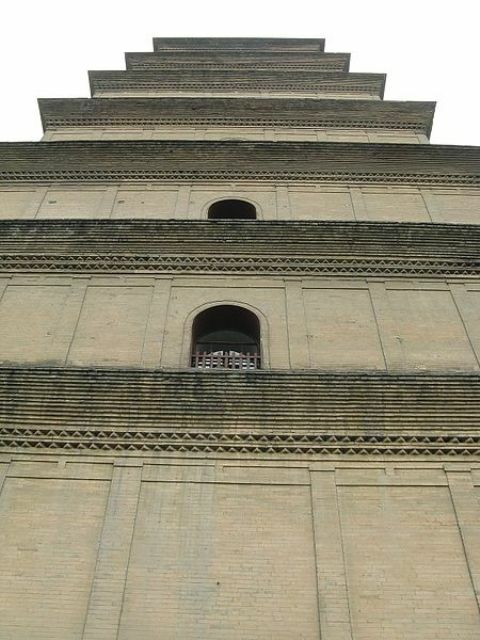 A large brick pillar and brick stairway lead all the way up to the fifth floor, but only the winding staircase outside the pagoda allows one to traverse all the way to the top where the steeple is located. This arrangement is often seen in stone pagodas, but rarely in brick ones. Phra Pathom Chedi (Thai: พระปฐมเจดีย์) is the tallest stupa in the world with the height of 127 metres (417 ft). It is located in the town of Nakhon Pathom, Thailand. 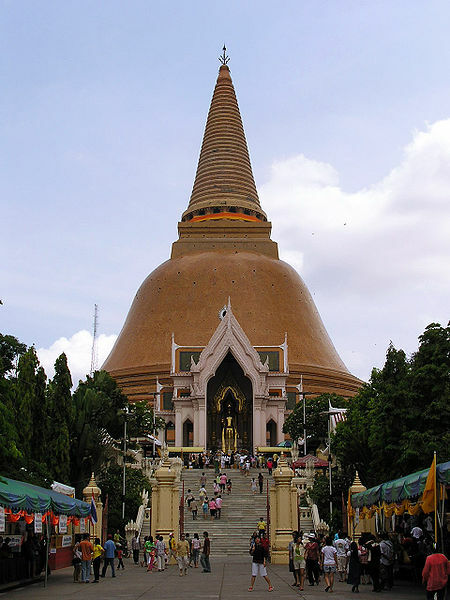 The name Phra Pathom Chedi means Holy chedi (stupa) of the beginning. The stupa at the location is first mentioned in Buddhist scriptures of the year 675, however archaeological findings date back to the 4th century. In the 11th century it was overbuilt with a Khmer (Ancient Cambodia) style prang, which was later overgrown by the jungle. The ruin was visited several times by the later King Mongkut during his time as a monk, and after his coronation he ordered the building of a new and more magnificent chedi at the site. After 17 years of construction it was finished in 1870, and the population of nearby Nakhon Chai Si was ordered to move to the newly created town around the chedi. Pha That Luang (Lao: ພຣະທາດຫຼວງ, IPA: pʰā tʰâːt lŭaːŋ, ‘Great Stupa’) is a gold-covered large Buddhist stupa on the eastern outskirts of Vientiane, Laos. Since its initial establishment suggested to be in the 3rd century, the stupa has undergone several reconstructions until the 1930s due to foreign invasions to the area. 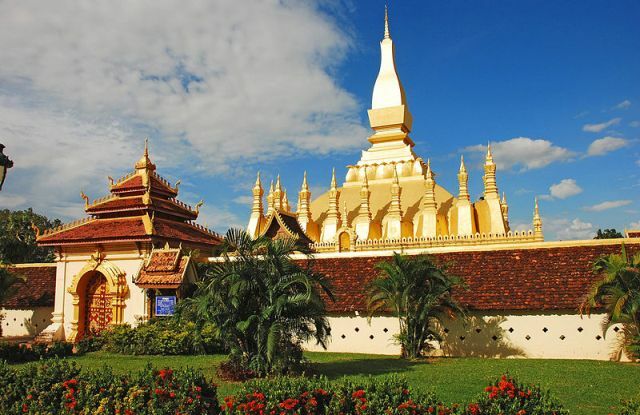 It is generally regarded as the most important national monument in Laos and a national symbol. Pha That Luang according to the Lao people was originally built as an Indic temple in the 3rd century. Buddhist missionaries from the Mauryan Empire are believed to have been sent by the Emperor Ashoka, including Bury Chan or Praya Chanthabury Pasithisak and five Arahata monks who brought a holy relic of Lord Buddha to the stupa. 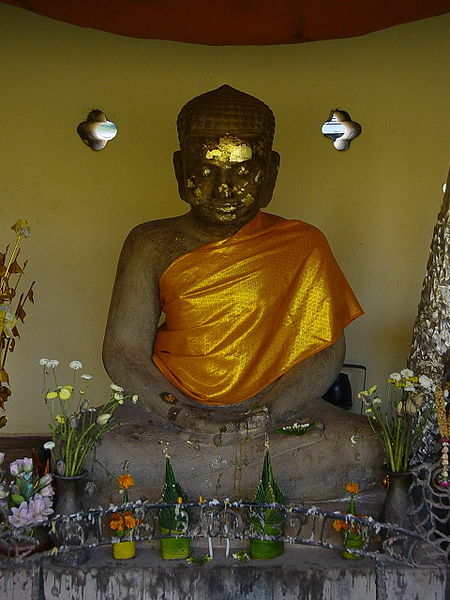 It was rebuilt in the 13th century as a Khmer temple which fell into ruin. 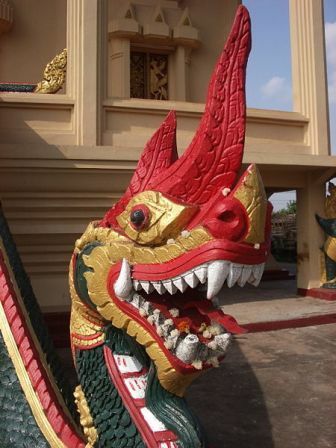 In the mid-16th century, King Setthathirat relocated his capital from Luang Prabang to Vientiane and ordered construction of Pha That Luang in 1566. It was rebuilt about 4 km from the centre of Vientiane at the end of That Luang Road and named Pha That Luang.The bases had a length of 69 meters each and was 45 meters high, and was surrounded by 30 small Stupas. 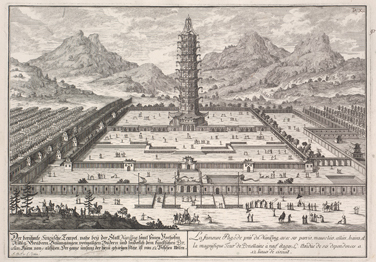 In 1641, a Dutch envoy of the Dutch East India Company, Gerrit van Wuysoff, visited Vientiane and was received by King Sourigna Vongsa at the temple, where he was, reportedly, received in a magnificent ceremony. He wrote that he was particularly impressed by the “enormous pyramid and the top was covered with gold leaf weighing about a thousand pounds. However, the stupa was repeatedly plundered by the Burmese, Siamese and Chinese. Pha That Luang was destroyed by the Thai invasion in 1828, which left it heavily damaged and left abandoned. It was not until 1900, when the French restored to its original design based on the detailed drawings from 1867 by the French architect and explorer Louis Delaporte. However the first attempt to restore it was unsuccessful and it had to be resigned and then reconstructed in the 1930s. The architecture of the building includes many references to Lao culture and identity, and so has become a symbol of Lao nationalism. The stupa today consists of three levels, each conveying a reflection of part of the Buddhist doctrine. The first level is 223 feet by 226 feet, the second is 157 feet along each side and the third level is 98 feet along each side. From ground to pinniacle, Pha That Luang is 147.6 feet high. The area around Pha That Luang is now gated, to keep traffic out. Previously visitors could drive around the whole complex. The encircling walls are roughly 279 feet long on each side and contain a large number of Lao and Khmer sculptures including one of Jayavarman VII. The Tianning Temple (Chinese: 天宁寺) is in Changzhou, Jiangsu, China. The temple is famous for its giant wooden Chinese pagoda. Construction began in April 2002 while the opening ceremony for the completed structure was held on April 30, 2007, where a crowd of hundreds of Buddhist monks gathered for the ceremony.With 13 stories and a height of 154 m (505 ft), this wooden pagoda is now the tallest pagoda in the world,taller than China’s tallest existent pre-modern Buddhist pagoda, the Liaodi Pagoda built in 1055 at a height of 84 m (275 ft). Although the existing pagoda was built by April 2007, the temple grounds and the pagoda have a history of construction and destruction for the past 1,350 years, since the time of the Tang Dynasty (618–907). Building of the pagoda was proposed by the Buddhist Association of China in 2001, yet providing money donations for the temple was an international effort, as leaders of 108 Buddhist associations and temples worldwide attended the opening ceremony at the temple. On 25 May 2006 the lower levels of the pagoda caught fire however no permanent damage was done. The grounds for the Tianning Temple Pagoda occupies a space of 27,000 m2 (290,625 ft2). 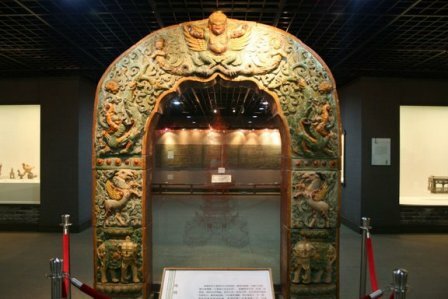 Complete with 68,038 kg (75 t) of gold and brass for the rooftops, additional bronze and jade decorations, and the use of wood imported from Myanmar and Papua New Guinea, the total cost of its construction was some 300 million yuan (US $38.5 million). 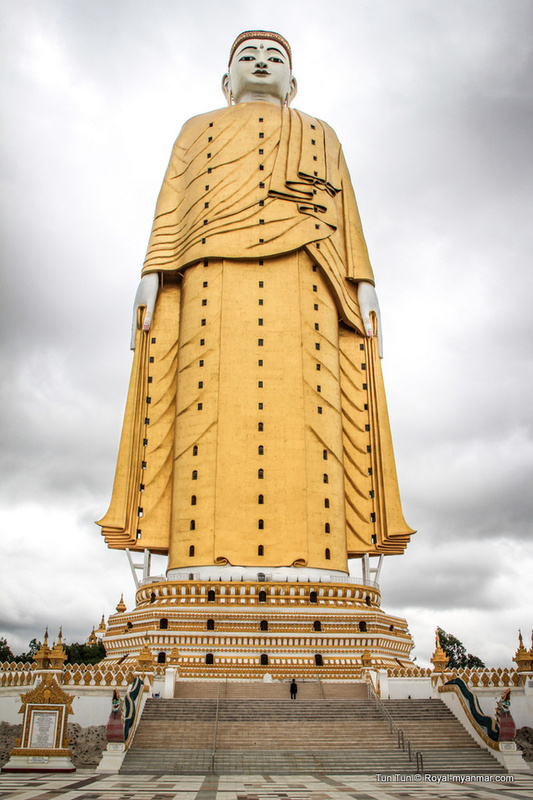 The top story of the pagoda features a golden spire and a large bronze bell weighing 30,000 kg (33 t). On the completion of the new pagoda at Tianning Temple, the mayor of Changzhou, Wang Weicheng, explicitly correlated his city’s economic development with that of religious development in China. Following the end of religious persecution after the tumultuous Cultural Revolution (1966–1976), the Chinese Communist Party has relaxed its control over religion, especially Chinese Buddhism, which has some 100 million adherents within the People’s Republic of China. The deputy abbot of Tianning Temple, Kuo Hui, said that like other religions Buddhism advocates peace and harmony, with ideas that could be beneficial to Chinese society. 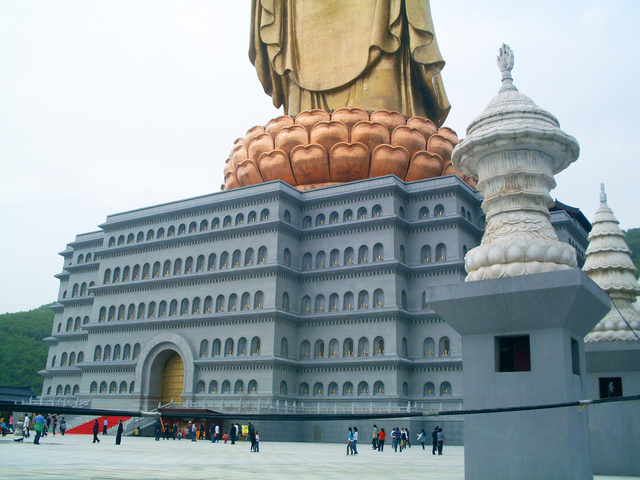 He also stated that the pagoda was rebuilt to “inherit the fine traditions of Buddhism and to honour Buddha. The pagoda is dedicated to Chinese Chan Buddhism. 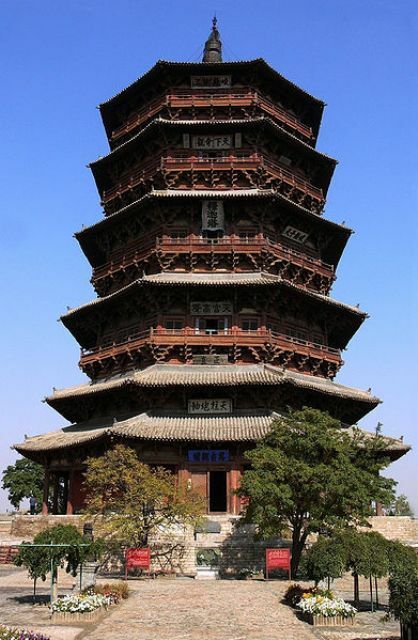 The Sakyamuni Pagoda of Fogong Temple (Chinese: 佛宫寺释迦塔; pinyin: Fógōng Sì Shìjiā Tǎ) of Ying County, Shanxi province, China, is a wooden Chinese pagoda built in 1056, during the Khitan-led Liao Dynasty. The pagoda was built by Emperor Daozong of Liao (Hongji) at the site of his grandmother’s family home.The pagoda, which has survived several large earthquakes throughout the centuries, reached a level of such fame within China that it was given the generic nickname of the “Muta” (Chinese: 木塔; pinyin: mùtǎ; literally “Timber Pagoda”). 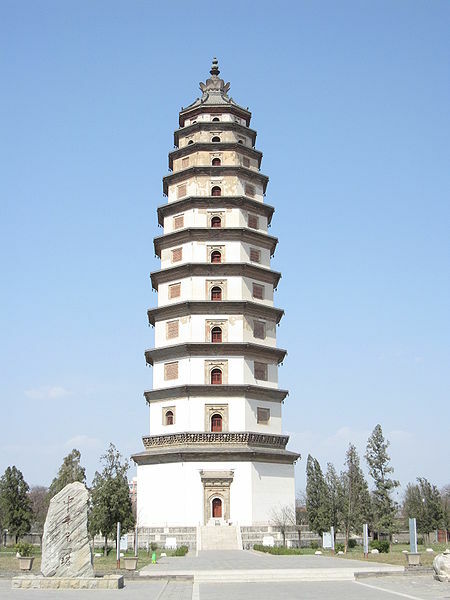 The pagoda stands on a 4 m (13 ft) tall stone platform, has a 10 m (33 ft) tall steeple, and reaches a total height of 67.31 m (220.83 ft) tall; it is the oldest existent fully-wooden pagoda still standing in China. 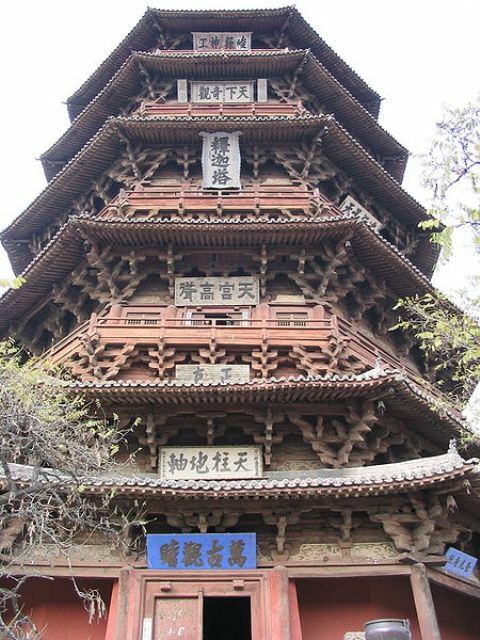 Although it is the oldest fully-wooden pagoda in China, the oldest existent pagoda is the 6th century Songyue Pagoda made of brick and the oldest existent wooden buildings in China date back to the mid Tang Dynasty (618–907), which are Buddhist temple halls found at Mount Wutai. Close-up detail of the dougong supports of the pagoda. 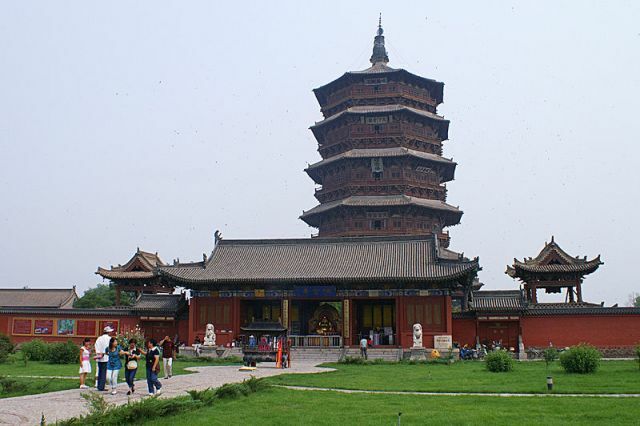 The Pagoda of Fogong Temple was built 85 km (52.8 miles) south of the Liao Dynasty capital at Datong. The Gujin Tushu Jicheng encyclopedia published in 1725—written during the reigns of Kangxi and Yongzheng in the Qing—states that a different pagoda built between the years 936–943 stood previously at the site before the present one of 1056 was built. The same statement appears in the Shanxi tongzhi (Record of Shanxi Province) and the Yingzhou xuzhi (Record of Ying Prefecture, Continued). The Yingzhou zhi (Record of Ying Prefecture)—edited by Tian Hui during the reign of the Wanli Emperor (r. 1572–1620) of the Ming Dynasty—states that the pagoda was funded and erected in 1056 by a Buddhist monk named Tian. In compiling a record for Ying County, Tian Hui of the late Ming Dynasty researched the history of the pagoda and recorded the history of its repairs in his Zhongxiu Fogongsi ta zhi. The placard on the third story of the pagoda listed that periodic repairs were conducted in the years 1195 and 1471. While piecing together the history of the pagoda, Tian Hui never came across any information to suggest that the pagoda had a predecessor built from 936 to 943, as other texts suggest. In confirming the date of 1056 and not the years 936–943, Zhang Yuhuan writes in his Zhongguo gudai jianzhu jishu shi (1985) that the Wenwu Laboratory determined various wooden components from the second to fifth floors of the pagoda to be 930 to 980 years old. Other evidence to suggest the later date includes the fact that the foster mother of Emperor Xingzong was a native of Yingzhou. Xingzong’s son Hongji (Emperor Daozong) was also raised in Ying County due to his following of the Khitan custom of raising Yelu clan sons within the families of their mothers. 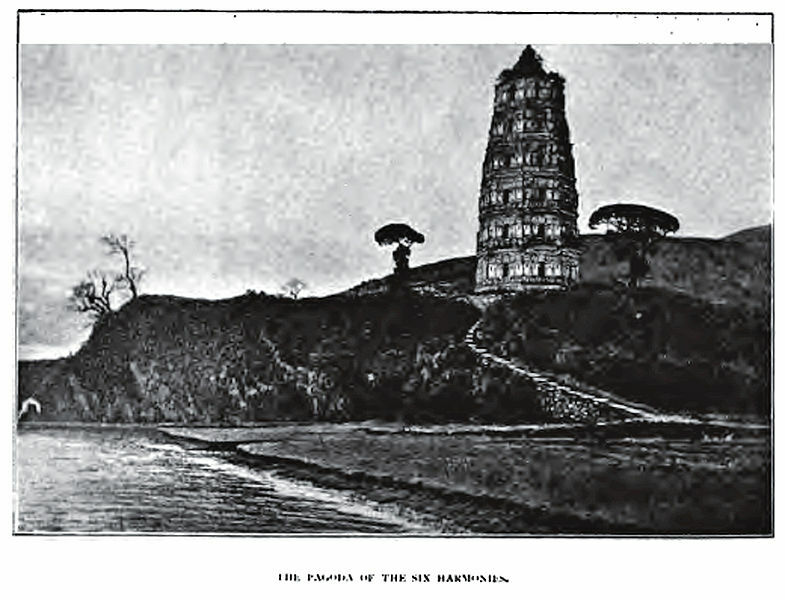 Hongji was also known as a devout Buddhist; the pagoda (following the tradition of the stupa) symbolized the death of the Buddha, which Hongji might have associated with his deceased father, the Xingzong Emperor. Steinhardt writes “only something like the memory of an imperial youth might account for the construction of such a phenomenal building in such an out-of-the way place. Also, the 1050s was a decade which marked the end of a Buddhist kalpa, which would signify the Pagoda of Fogong Temple as an “ultimate death shrine to the Buddha of the age,” according to historian Nancy Steinhardt.This occurred at roughly the same time in which Fujiwara no Yorimichi of Japan converted the Phoenix Hall of his father Fujiwara no Michinaga‘s residence at Byōdō-in into a temple meant to guide souls into the Buddhist afterlife (according to Pure Land Buddhism). 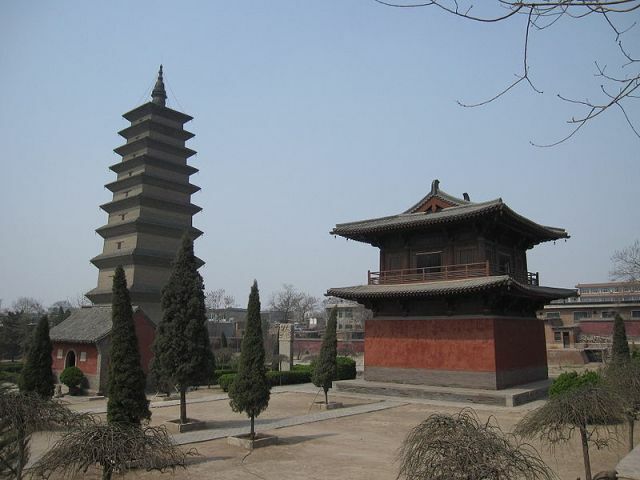 The pagoda was placed at the center of the temple grounds, which used to be called Baogong Temple until its name was changed to Fogong in 1315 during the Yuan Dynasty. [ Although the size of the temple grounds were described as being gigantic during the Jurchen-led Jin Dynasty (1115–1234), the temple began to decline during the Ming Dynasty. 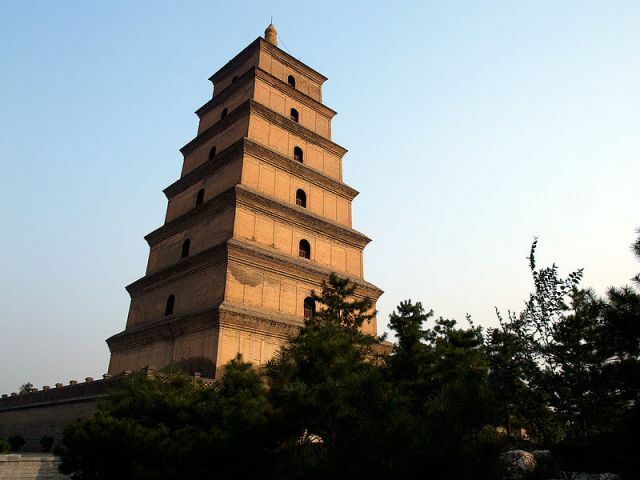 The Yingzhou zhi records that there was a total of seven earthquakes between the years 1056 and 1103, yet the tower stood firm.In its entire history before the 20th century, the pagoda needed only ten minor repairs. However, considerable repairs were needed after Japanese soldiers shot more than two hundred rounds into the pagoda during the Second Sino-Japanese War. [While repairing the pagoda in 1974, renovators found Liao Dynasty texts of Buddhist sutras and other documents that were printed, attesting to the widespread technological use of movable type printing that developed within the neighboring Song Dynasty. The pagoda features fifty-four different kinds of bracket arms in its construction, the greatest amount for any Liao Dynasty structure. Between each outer story of the pagoda is a mezzanine layer where the bracket arms are located on the exterior. From the exterior, the pagoda seems to have only five stories and two sets of rooftop eaves for the first story, yet the pagoda’s interior reveals that it has nine stories in all. The four hidden stories can be indicated from the exterior by the pagoda’s pingzuo (terrace balconies). A ring of columns support the lowest outstretching eaved roof on the base floor, while the pagoda also features interior support columns. A statue of the Buddha Sakyamuni sits prominently in the center of the first floor of the pagoda, with an ornate zaojing (caisson) above its head (the pagoda is named Sakyamuni Pagoda due to this statue). 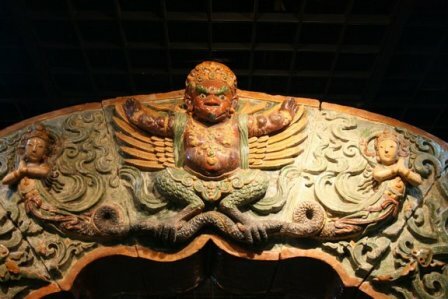 A zaojing is also carved into the ceiling of every story of the pagoda. The windows on the eight sides of the pagoda provide views of the countryside, including Mount Heng and the Songgan River. On a clear day, the pagoda can be seen from a distance of 30 km (18.6 miles). 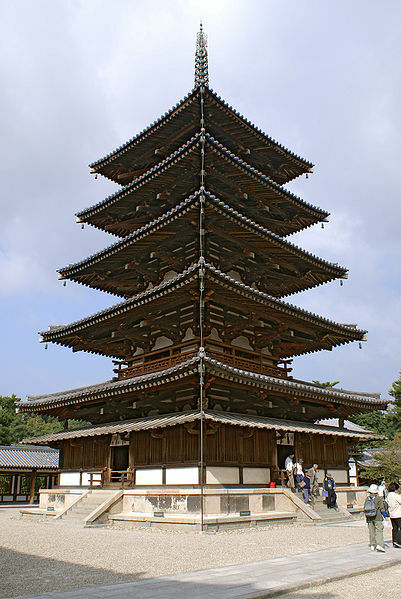 Wooden five-story pagoda of Hōryū-ji in Japan, built in 7th century, one of the oldest wooden pagodas in the world. A pagoda is the general term in the English language for a tiered tower with multiple eaves common in China, Japan, Korea, Vietnam, Nepal and other parts of Asia. Some pagodas are used as Taoist houses of worship. Most pagodas were built to have a religious function, most commonly Buddhist, and were often located in or near temples. This term may refer to other religious structures in some countries. In Vietnam, pagoda is a more generic term referring to a place of worship, although pagoda is not an accurate word to describe a Buddhist temple. The modern pagoda is an evolution of the Ancient Indian stupa, a tomb-like structure where sacred relics could be kept safe and venerated. The architectural structure of the stupa has spread across Asia, taking on many diverse forms as details specific to different regions are incorporated into the overall design. The origin of the pagoda can be traced to the Indian stupa (3rd century BC). The stupa, a dome shaped monument, was used in India as a commemorative monument associated with storing sacred relics. The stupa emerged as a distinctive style of Indian architecture and was adopted in Southeast and East Asia, where it became prominent as a Buddhist monument used for enshrining sacred relics. In East Asia, the architecture of Chinese towers and Chinese pavilions blended into pagoda architecture, eventually also spreading to Southeast Asia. 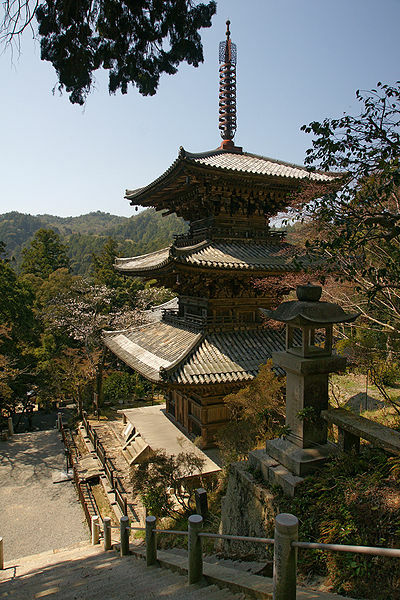 The pagoda’s original purpose was to house relics and sacred writings.This purpose was popularized due to the efforts of Buddhist missionaries, pilgrims, rulers, and ordinary devotees to seek out, distribute, and extol Buddhist relics. Chinese iconography is noticeable in Chinese pagoda as well as other East Asian pagoda architectures. 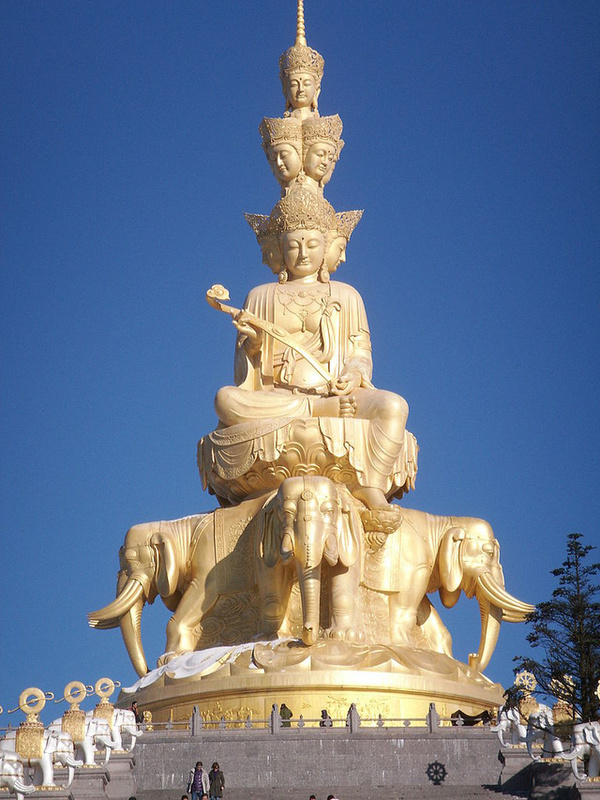 The image of the Shakyamuni Buddha in the abhaya mudra is also noticeable in some Pagodas. Buddhist iconography can be observed throughout the pagoda symbolism. 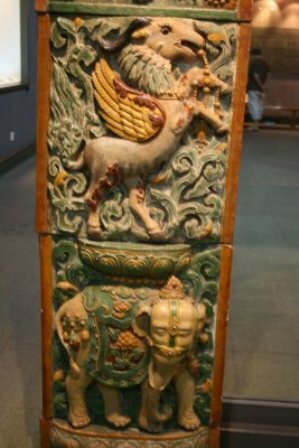 In an article on Buddhist elements in Han art, Wu Hung suggests that in these tombs, Buddhist iconography was so well incorporated into native Chinese traditions that a unique system of symbolism had been developed. Pagodas attract lightning strikes because of their height. 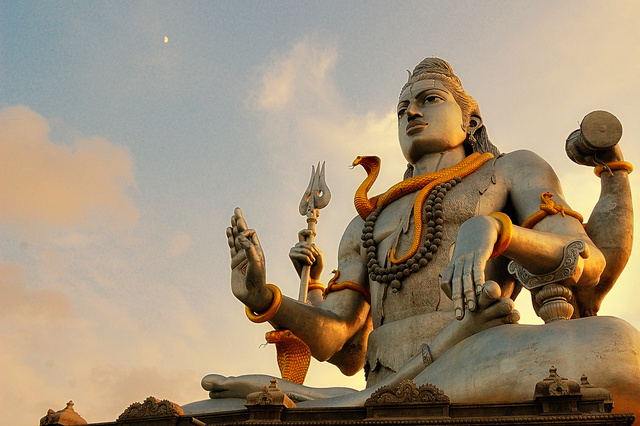 This tendency may have played a role in their perception as spiritually charged places. Many pagodas have a decorated finial at the top of the structure. The finial is designed in such a way as to have symbolic meaning within Buddhism; for example, it may include designs representing a lotus. The finial also functions as a lightning rod, and thus helps to both attract lightning and protect the pagoda from lightning damage. Early pagodas were constructed out of wood, but steadily progressed to sturdier materials, which helped protect against fires and rot. Pagodas traditionally have an odd number of levels, a notable exception being the eighteenth century pagoda “folly” designed by Sir William Chambers at Kew Gardens in London. The Bombardier Pagoda, or Pagoda Tower, at the Indianapolis Motor Speedway. 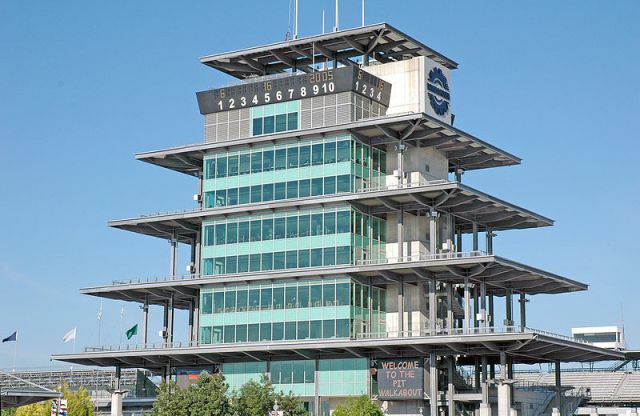 This 13-story pagoda, used as the control tower for races such as the Indy 500, has been transformed several times since it was first built in 1913. 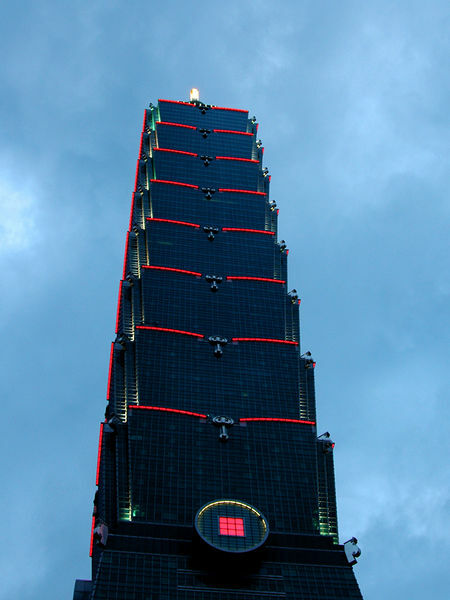 Taipei 101 in Taiwan, record setter for height (508m) in 2004 and currently the world’s second tallest completed building. Mercedes-Benz W113, nicknamed Pagoda for its concave hard top roof line. Included are the 1964-1971 230SL, 250SL, and 280SL sport coupes. 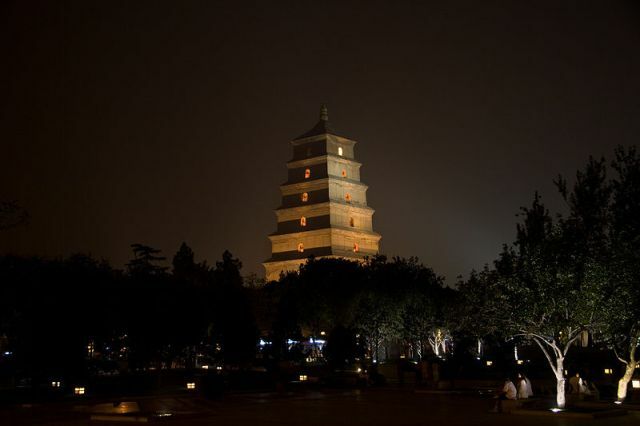 The Beisi Pagoda (Chinese: 北寺塔; pinyin: Běisì Tǎ; Wade-Giles: Peiszu T’a) or North Temple Pagoda is a Chinese pagoda located at Bao’en Temple in Suzhou, Jiangsu Province, China. The base of the pagoda has an octagonal frame, and the tower rises nine stories in a total height of 76 m (243 ft). The pagoda was once eleven stories tall, yet was damaged and reduced to nine stories. 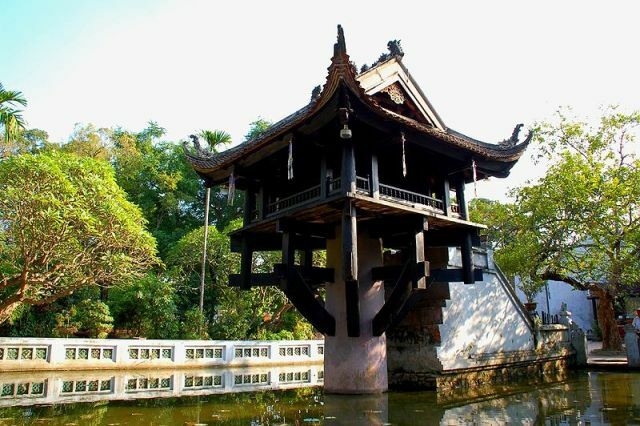 its double eaves and flying corners are similar to that of the Liuhe Pagoda found in Hangzhou. Its base and outside walls are made of brick, the balustrades made of stone, and the eaves and banisters encircling the structure are made of wood. Although the present structure dates to the Ming Dynasty (1368–1644) (with renovations in following eras), the historical site of construction for the pagodas dates back 1,700 years. A Buddhist pagoda built during the reign of Sun Quan in the 3rd century originally stood at the site (in honor of his wet nurse), along with another pagoda built during the Liang Dynasty (502-557). 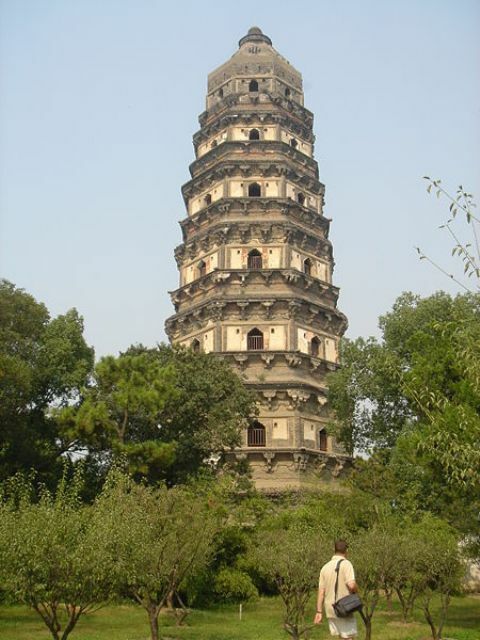 The current design of the pagoda structure was made between the years 1131 and 1162, during the Song Dynasty (960-1279). Patronage and construction for the Song era pagoda was headed by the Buddhist monk Dayuan. However, the pagoda was burnt down by fire towards the end of the Song Dynasty and rebuilt during the MIng. Daqin Pagoda (大秦塔) in Chang’an, Shaanxi Province, located about two kilometres to the west of Lou Guan Tai temple is the remnant of the earliest surviving Christian church in China. The church and the monastery were built in 640 by early Nestorian missionaries. Daqin is the name for the Roman Empire in the early Chinese language documents of the first and second century, by the mid-ninth century it was also used to refer to the mission churches of the Syriac Christians. Persecution of Christians in China led to the abandonment of Daqin in about 845. Much later, in 1300, a Buddhist temple was installed in the pagoda. An earthquake severely damaged the pagoda in 1556 and it was finally abandoned. Due to the earthquake, many of the underground chambers of the complex are no longer reachable. Daqin was “rediscovered” in 1998 and its roots in early Chinese Christiagrnity were recognized. Inside the pagoda, artistic works in both Western and Asiatic style can still be found, among them Jonah at the walls of Nineveh, a nativity scene and Syriac graffiti. Many of these artworks are made from mud and plaster, which suffered during prior centuries from exposure to the elements. Seismic activity and flooding endanger the stability of the pagoda. In 1999, the pagoda’s exterior was restored, but overall stability was not improved. Further restoration of the site is planned, as well as exploration, most probably by remote probe, of the collapsed underground chambers. Outside of the pagoda, a replica of the Nestorian Stele and its stone tortoise have been installed. Giant Wild Goose Pagoda or Big Wild Goose Pagoda (Chinese: 大雁塔; pinyin: Dàyàn Tǎ), is a Buddhist pagoda located in southern Xi’an, Shaanxi province, China. It was built in 652 during the Tang Dynasty and originally had five stories, although the structure was rebuilt in 704 during the reign of Empress Wu Zetian and its exterior brick facade was renovated during the Ming Dynasty. 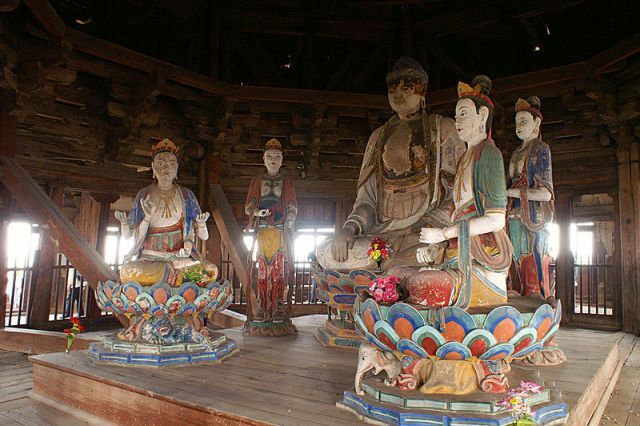 One of the pagoda’s many functions was to hold sutras and figurines of the Buddha that were brought to China from India by the Buddhist translator and traveler Xuanzang. The original pagoda was built during the reign of Emperor Gaozong of Tang (r. 649-683), then standing at a height of 54 m (177 ft). However, this construction of rammed earth with a stone exterior facade eventually collapsed five decades later. 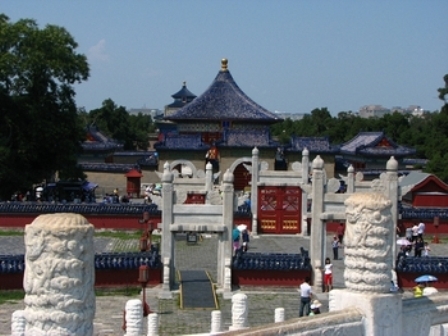 The ruling Empress Wu Zetian had the pagoda rebuilt and added five new stories by the year 704 AD. However, a massive earthquake in 1556 heavily damaged the pagoda and reduced it by three stories, to its current height of seven stories. The entire structure leans very perceptibly (several degrees) to the west. 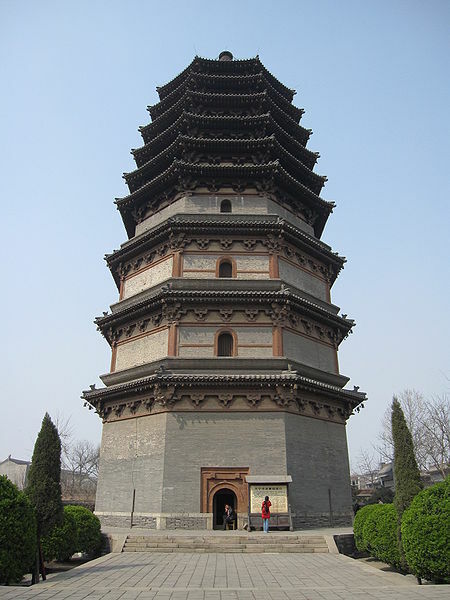 Its related structure, the 8th century Small Wild Goose Pagoda in Xi’an, only suffered minor damage in the 1556 earthquake (still unrepaired to this day). The Giant Wild Goose Pagoda was extensively repaired during the Ming Dynasty (1368–1644) and renovated again in 1964. The pagoda currently stands at a height of 64 m (210 ft) tall and from the top it offers views over the current city of Xi’an. 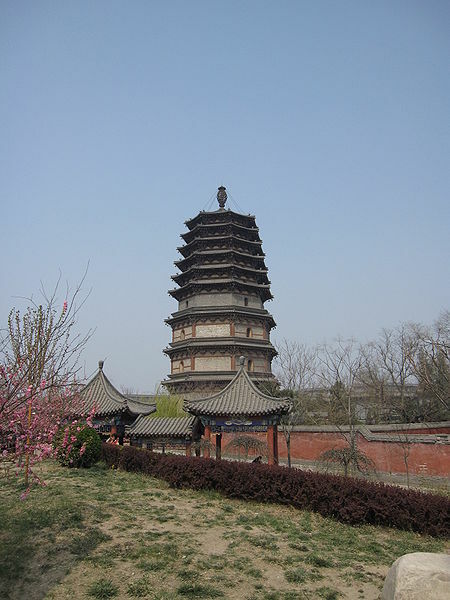 During the Tang Dynasty the pagoda was located within the grounds of a monastery, within a walled ward of the larger southeastern sector of the city, then known as Chang’an. The monastic grounds around the pagoda during the Tang Dynasty had ten courtyards and a total of 1,897 bays. [ In those days graduate students of the Advanced Scholars examination in Chang’an inscribed their names at this monastery. Close by the pagoda is the Temple of Great Maternal Grace; Da Ci’en. This temple was originally built in AD 589 and then rebuilt AD 647 in memory of his mother Empress Wende by Li Zhi who later became the Tang Emperor Gaozong. 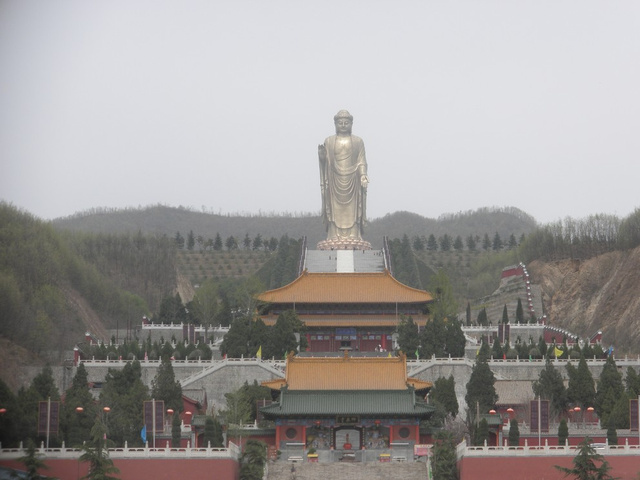 The monk Xuanzang‘s statue stands in front of the temple area. Structural engineer Nandadeep Building Center (NPPCPL) Aurangabad M.S. The center of the Global Vipassana Pagoda contains the world’s largest stone dome built without any supporting pillars. The height of the dome is approximately 29 metres, while the height of the building is 96.12 meters, which is twice the size of the previously largest hollow stone monument in the world, the Gol Gumbaz Dome in Bijapur, India. External diameter of the largest section of the dome is 97.46m and the shorter sections is 94.82m. Internal diamter of the dome is 85.15m.The inside of the pagoda is hollow and serves as a very large meditation hall with an area covering more than 6000 m2 (65,000 ft2). The massive inner dome seats over 8000 people enabling them to practice the non-sectarian Vipassana meditation as taught by Mr S.N. Goenka and now being practiced in over 100 countries. An inaugural one-day meditation course was held at the pagoda on December 21 2008, with Mr S.N. Goenka in attendance as the teacher. 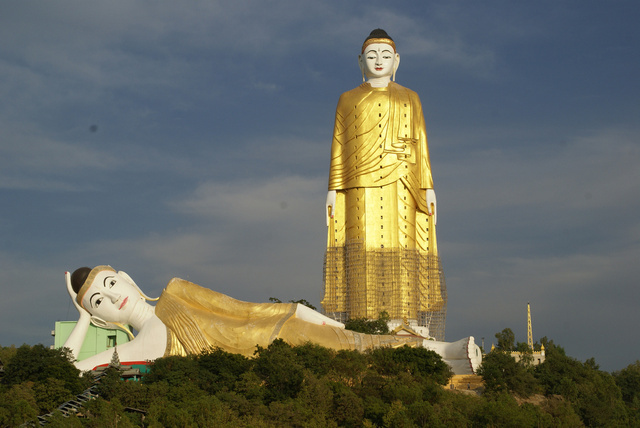 The aim of the pagoda complex is, among others, to express gratitude to Gautama Buddha for dispensing for what followers believe is a universal teaching for the eradication of suffering, to educate the public about the life and teaching of the Buddha, and to provide a place for the practice of meditation. 10-day vipassana meditation courses are held free of charge at the meditation centre that is part of the Global Vipassana Pagoda complex. Meditators seated inside the Global Pagoda dome. 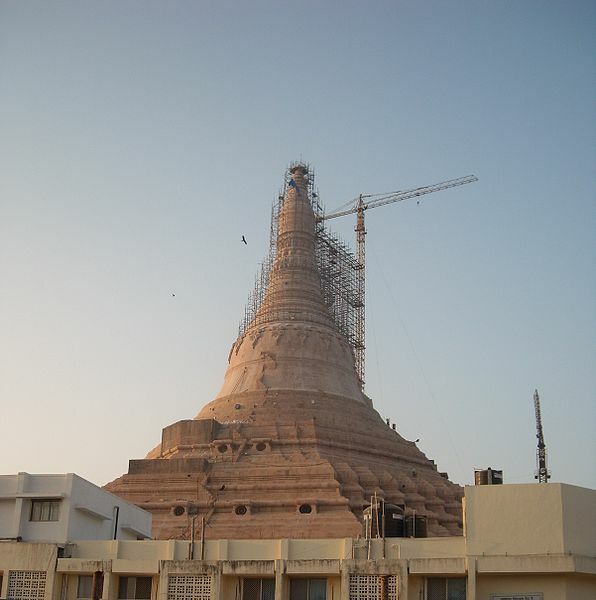 Planning for the construction of the Global Vipassana Pagoda began in 1997, while actual building work started in 2000. The pagoda consists of three sub-domes. The first and largest dome was completed in October 2006 when bone relics of Gautama Buddha were enshrined in the central locking stone of the dome on October 29 2006, making it the world’s largest structure containing relics of the Buddha. 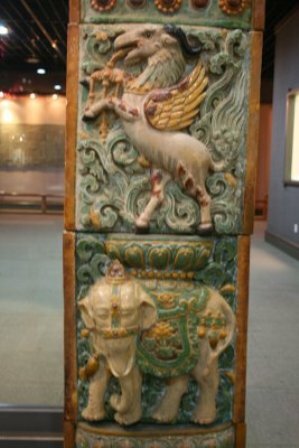 The relics were originally found in the stupa at Sanchi. They have been donated by the Mahabodhi Society of India and the prime minister of Sri Lanka to be kept at the Global Vipassana Pagoda.The second and third domes sit atop the first dome. Construction of the third dome was structurally completed on November 21 2008. 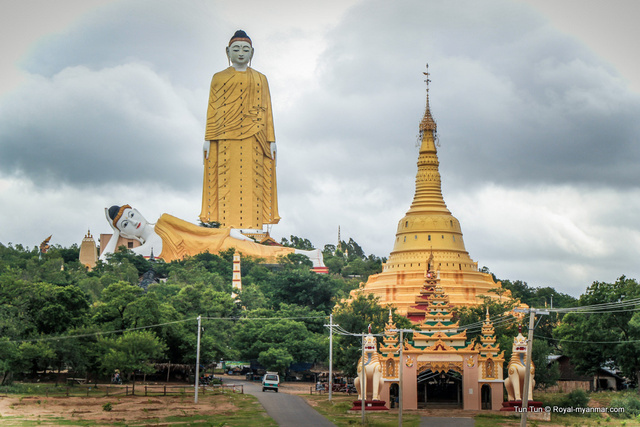 The Global Vipassana Pagoda complex is still under construction with plans to include a museum depicting the life and teaching of Gautama Buddha that is expected to draw one hundred thousand visitors annually. The Global Vipassana Pagoda’s educational displays will communicate the Buddha’s universal teaching as a path towards real happiness. 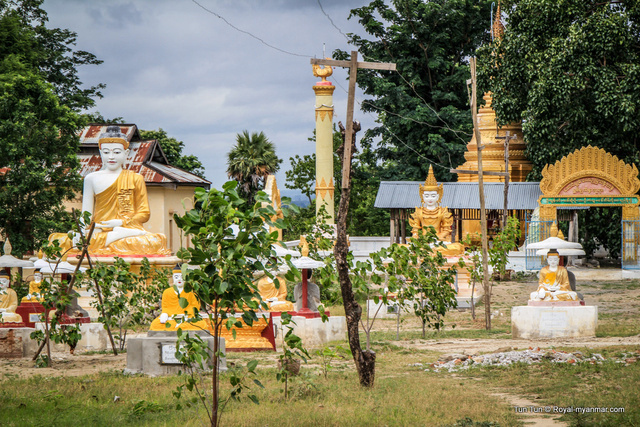 The south pagoda, once completed, will contain 100 meditation cells for use by Vipassana students taking a meditation course at the adjoining meditation centre. The foundation of the dome consists of basalt, while the dome itself is made from sandstone imported from Rajasthan. The individual blocks of sandstone weigh 600-700 kg each and are joined by lime mortar. 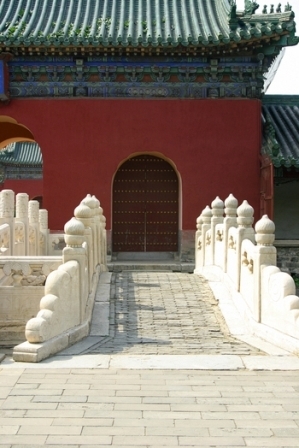 The circumambulation path is laid in marble. The pinnacle of the pagoda is adorned with a large crystal. The spire is covered in real gold, while the rest of the pagoda will be covered in gold paint. The spire is topped with a special ornamental umbrella piece donated by the Burmese. The main doors to the pagoda are wooden and hand-carved in Myanmar (Burma). 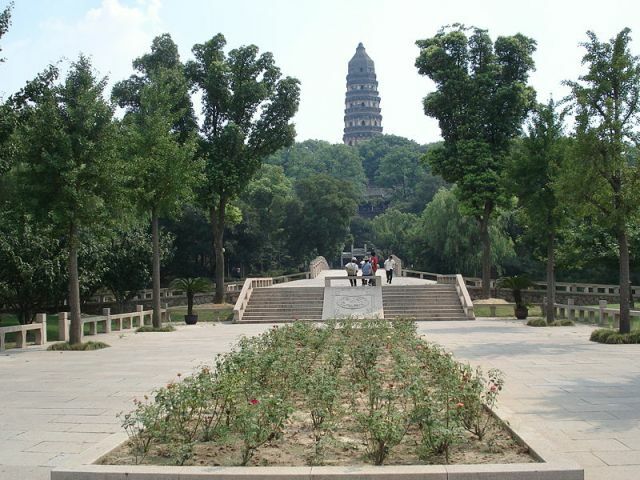 The Huqiu Tower, or Yunyan Pagoda and Tiger Hill Pagoda, (Chinese: 云岩寺塔; pinyin: Yún yán sì tǎ or Chinese: 虎丘塔; pinyin: Hŭ qiū tǎ) is a Chinese pagoda situated at Changmen in Suzhou City, Jiangsu Province. It has several other names, including the ‘Leaning Tower of China’ (as referred to by historian O.G. Ingles) and the Yunyan Temple Tower. The tower was built in the later period of the Five Dynasties (907-960 CE), completed by the second year of the Song Dynasty. The tower rises to a height of 47 m (154 ft). It is a seven-story octagonal building built with blue bricks. In more than a thousand years the tower has gradually slanted due to forces of nature. Now the top and bottom of the tower vary by 2.32 meters. The entire structure weighs some 7,000,000 kg (7000 tonnes), supported by internal brick columns. However, the tower leans roughly 3 degrees due to the cracking of two supporting columns. The tower leans because the foundation is originally half rock and the other half is on soil. In 1957, efforts were made to stabilize the tower and prevent further leaning. Concrete was also pumped into the soil forming a stronger foundation. During the reinforcement process, a stone casket containing Buddhist scriptures was found. The container had an inscription noting the completion date of the tower as the seventeenth day of the twelfth month of the second year of the reign of Jianlong (961 AD); according to O.G Ingles it was built in 959.O.G. Ingles writes that the better name for the Tiger Hill Pagoda should be the “‘Leaning Tower of China’, since it predates the famous Italian structure.”The uppermost stories of the tower were built as an addition during the reign of the Chongzhen Emperor (1628–1644), the last emperor of the Ming Dynasty. 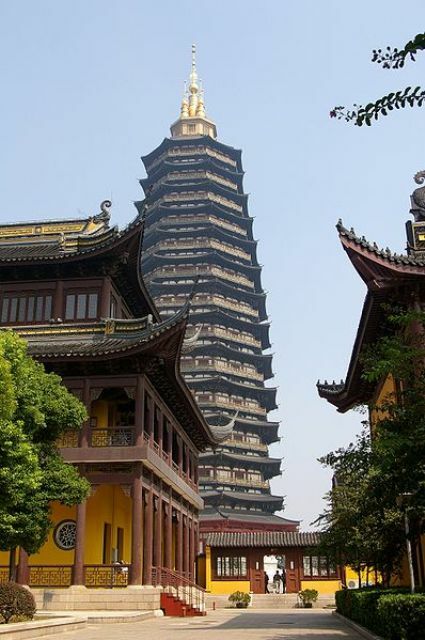 The Liaodi Pagoda (traditional Chinese: 料敵塔; simplified Chinese: 料敌塔; pinyin: Liàodí Tǎ; Wade-Giles: Liaoti T’a) of Kaiyuan Monastery, Dingzhou, Hebei Province, China is the tallest existing pre-modern Chinese pagoda, built in the 11th century during the Song Dynasty (960-1279). 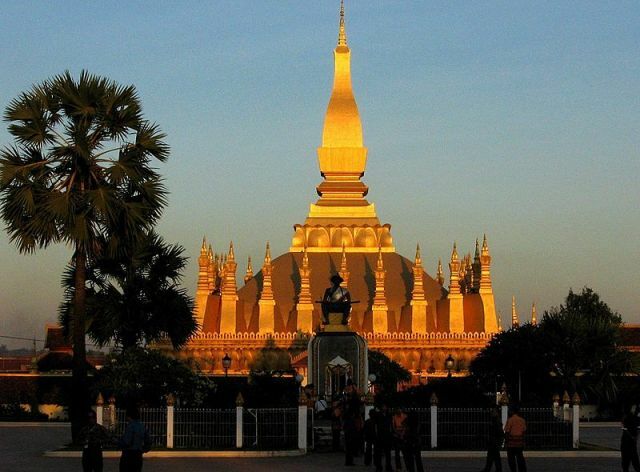 The pagoda stands at a height of 84 metres (276 ft), resting on a large platform with an octagonal base. 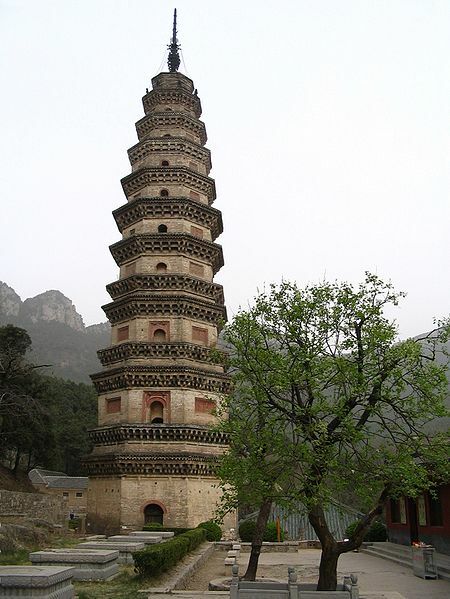 Upon completion in 1055, the Liaodi Pagoda surpassed the height of China’s previously tallest pagoda still standing, the central pagoda of the Three Pagodas built during the Tang Dynasty, which stands at 69.13 m (230 ft). 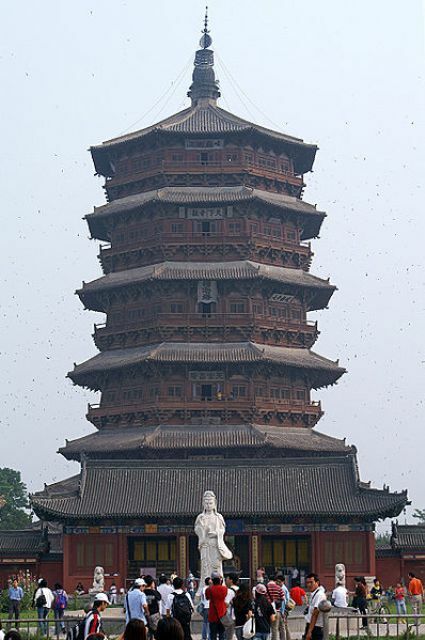 The tallest pagoda in pre-modern Chinese history was a 100-metre-tall (330 ft) wooden pagoda tower in Chang’an built in 611 by Emperor Yang of Sui, yet this structure no longer stands. A closeup of a door at the Liaodi Pagoda of Kaiyuan Temple in Dingzhou, China. 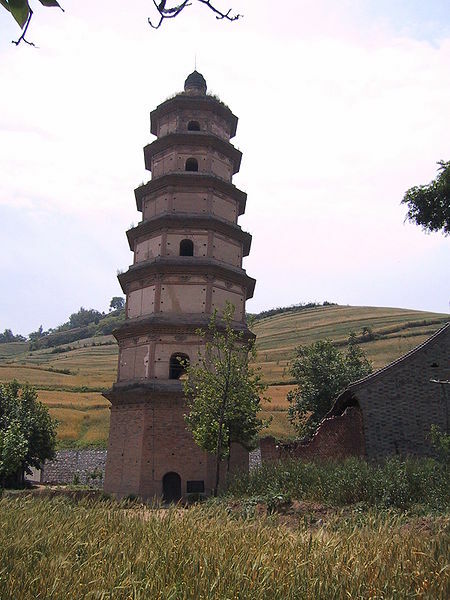 Another pagoda of similar height and design is the Chongwen Pagoda of Shaanxi Province. Completed in 1605 during the Ming Dynasty, this pagoda stands at a height of 79 m (259 ft), making it the second tallest pagoda built in pre-modern China. Each floor of the Liaodi Pagoda features gradually-tiered stone eaves, doors and windows (with false windows on four sides of the octagonal structure) while the first floor has an encircling balcony. A split section of the pagoda’s walls are open so that the tower’s interior may be viewed, along with the actual thickness of the walls. At the top of its steeple, the pagoda features a crowning spire made of bronze and iron. In the interior a large staircase with landings for each floor winds from the bottom all the way up to the top floor. Brick brackets are used to support the landings on each floor, while from the eighth story up there are no brackets supporting the vaulted ceiling. Within the pagoda is a large pillar in the shape of another pagoda, as seen from the inside and as viewed from the cut section. The painted murals and stone steles with Chinese calligraphy in the pagoda are dated to the Song period when the pagoda was built. 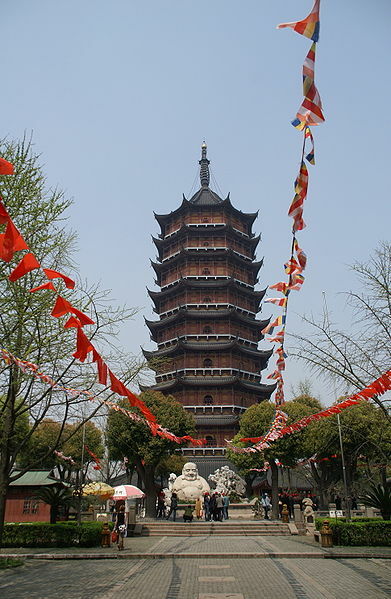 Liuhe Pagoda (Chinese: 六和塔; pinyin: Liùhé Tǎ), literally Six Harmonies Pagoda or Six Harmonies Tower, is multi-storied Chinese pagoda in southern Hangzhou, Zhejiang province, China. It is located at the foot of Yuelun Hill, facing the Qiantang River. It was originally constructed during the Northern Song Dynasty (960 – 1127 AD), destroyed in 1121, and reconstructed fully by 1165, during the Southern Song Dynasty (1127 – 1279 AD). The pagoda was originally constructed by the ruler of the Wuyue State, some of which would later makeup Zhejiang province. The name ‘Liuhe’ comes from the six Buddhist ordinances and it is said that the reason for building the pagoda was to calm the tidal bore of the Qiantang River and as a navigational aid. However, the pagoda was completely destroyed during warfare in the year 1121. After the current pagoda was constructed of wood and brick during the Southern Song Dynasty, additional exterior eaves were added during the Ming (1368 – 1644) and Qing Dynasties (1644 – 1911). 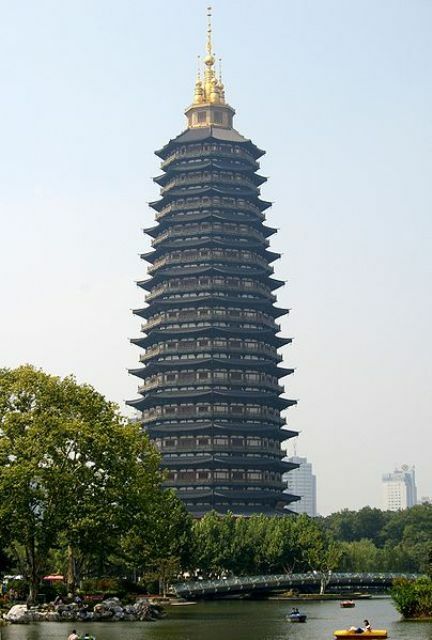 The pagoda is octagonal in shape and some 59.89 meters (196 feet) in height, it also has the appearance of being a thirteen-story structure, though it only has seven interior stories. There is a spiral staircase leading to the top floor and upon each of the seven ceilings are carved and painted figures including animals, flowers, birds and characters. Each story of the pagoda consists of four elements, the exterior walls, a zigzagged corridor, the interior walls and a small chamber. Viewed from outside, the pagoda appears to be layered-bright on the upper surface and dark underneath. That is a harmonious alternation of light and shade. According to historian Joseph Needham, the pagoda also served as a lighthouse along the Qiantang River. Being of considerable size and stature, it actually served as a permanent lighthouse from nearly its beginning, to aid sailors in seeking anchorage for their ships at night (as described in the Hangzhou Fu Zhi). A small “Pagoda Park” has recently been opened nearby. Its an exhibition features models of ancient Chinese pagodas, and illustrates the variety of different designs, and the history, culture and symbols associated with the pagoda. The Lingxiao Pagoda of Zhengding, Hebei Province, a half-brick half-wooden pagoda built in 1045 AD, with little change in renovations since. The Lingxiao Pagoda (Chinese: 凌霄塔; pinyin: Língxiāo tǎ; Wade-Giles: Linghsiao T’a) is a Chinese pagoda west of the Xinglong Temple in Zhengding, Hebei Province, China. The original pagoda that stood at the same site was dubbed the Wooden Pagoda, and was built in 860 AD during the Tang Dynasty (618-907). The pagoda’s present form of brick and wood dates to 1045 AD during the reign of Emperor Renzong (1022-1063) of the Song Dynasty (960-1279), and was renovated and restored in the Yuan, Ming, and Qing dynasties. It was formerly part of the Tianning Monastery, and although the latter no longer exists, the pagoda has been well-preserved since the 11th century. In 1966 the pagoda was damaged in an earthquake, but immediate repairs have kept it standing and open to the public. The brick base and structure of the 42 m (137 ft) tall pagoda ends after the 4th floor, as the rest of its height from the 5th floor up is purely wooden construction. It features a total of nine stories with nine wooden tiers of eaves encircling the octagonal frame of the pagoda. In the center of the pagoda stands a large column, a feature of Chinese architecture in pagodas that was discontinued sometime after the Song and Yuan periods. Built a decade later in 1055, the Liaodi Pagoda (China’s tallest pre-modern pagoda) also features an inner column, in the shape of another pagoda. 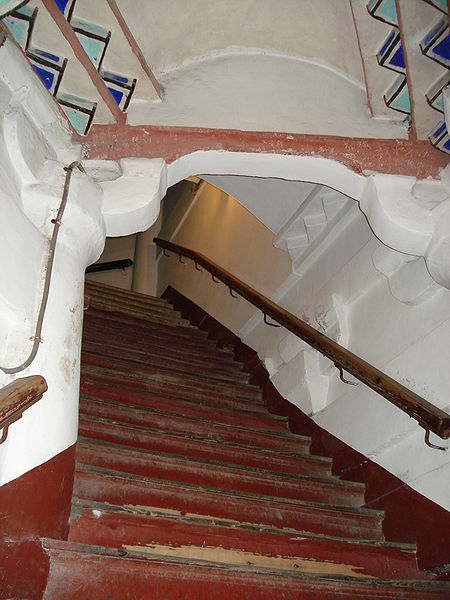 Within the interior of the Lingxiao Pagoda, a wooden staircase leads up to the 4th floor. The pagoda is also crowned with a cast iron spire. 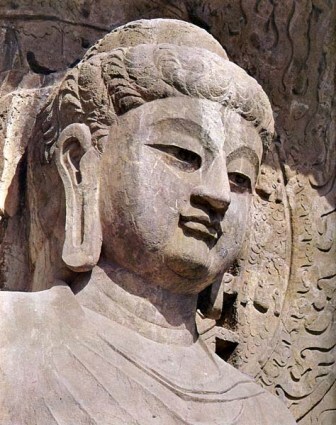 The idea of constructing Buddhist temples by hollowing out rock faces was brought to China from Central Asia, where monuments of this sort had been constructed for centuries. 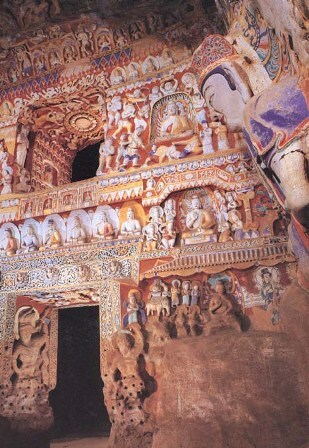 Over the years, more and more caves would be excavated and decorated as pious acts on the part of monks and artists. 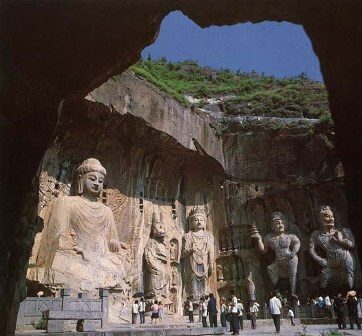 Most of the cave temples were begun in the north during the Northern Dynasties. 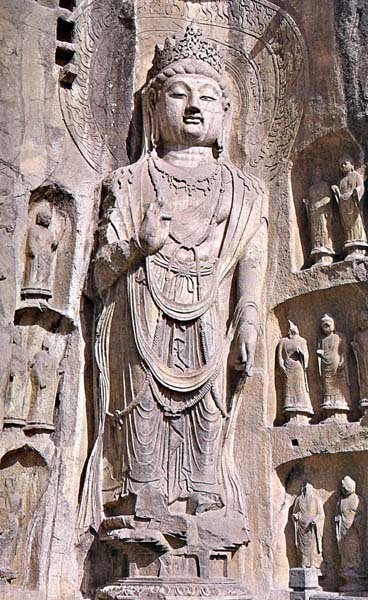 Cave temples at Dunhuang were begun in 366; at Bingling and Maijishan in the early fifth century; at Yungang in 460; at Longmen and Gongxian in the early sixth century. During the Tang period additions were made to many of these cave temple complexes, especially Dunhuang and Longmen. 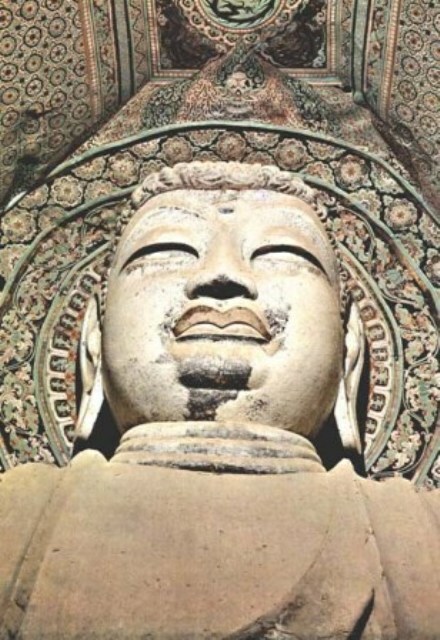 Positioned in the furthest reaches of northwestern China, Dunhuang served as a gateway into China from Central Asia. Beginning in the fifth century, and continuing through the tenth, approximately five hundred rooms were carved into the area’s soft rock. These rooms were decorated with sculptures and frescoes in styles which changed over the centuries. 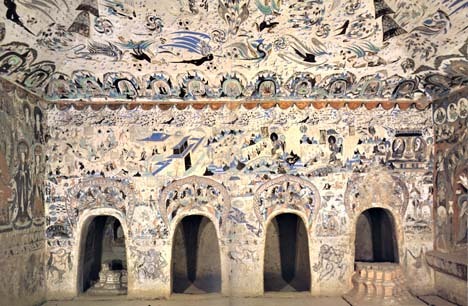 What you see here is only a tiny fraction of the art that can still be seen in the 492 surviving caves at Dunhuang. 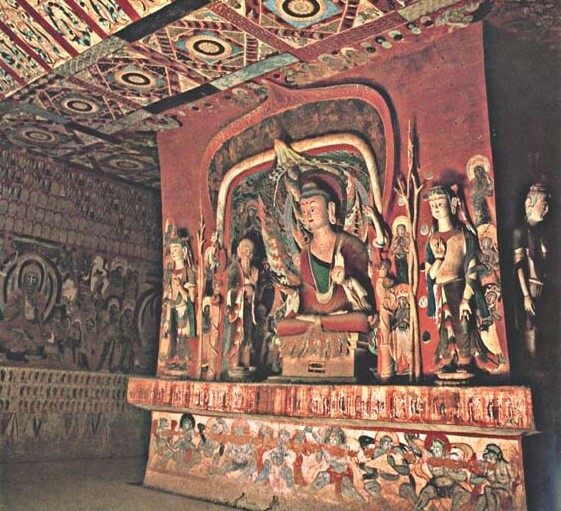 Below is a painted room in Dunhuang, which was first completed in the Western Wei period (6th century). What visual effect is achieved by a room completely decorated with painted images? Does the style of the painted images evoke any particular emotional response from the viewer? Below is a painted stone relief altar. 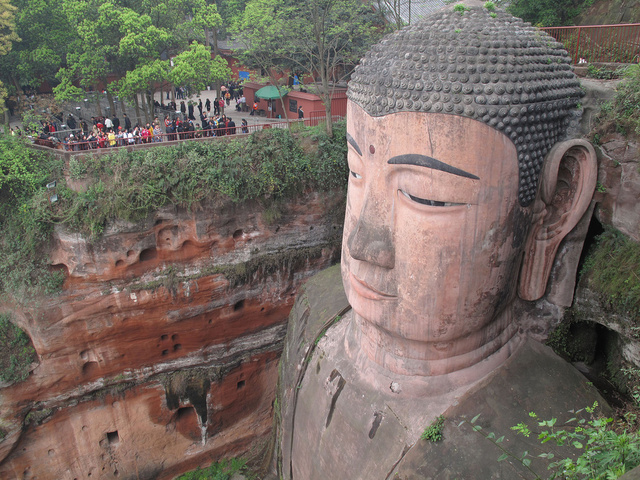 Buddhism, begun in 446, lasted until his death in 452.
the excavation of some of the enormous caves at Yungang. Today, over 50,000 statues from the 52 caves survive. caves here (Caves 21-45) date back to the 5th century. from a distance, as seen below. within the history of Buddhism during the Northern Wei? figure is situated in its own niche? composition of the art displayed on these walls. To review images from Yungang shown in previous sections of this unit click here. approximately 1,300 caves of Longmen. to 17 m (56 ft). during the first half of the eighth century. is by just looking at the face? Below we see a full view of the massive stone statue of which you just saw a detail. identify which figure was just shown to you? Can you identify the figure second to the right of him? portrayed by small, repeated images. would repeat an image of a sacred figure?. Overview of the Temple of Heaven, Beijing. Photo docsdl. Detail of the beautiful Hall of Heavenly Prayer. Photo Sergio Nasi. The House of Heavenly Lord at Tian Tan. Photo Rob Rogoyski. View over the Tian Tan temple complex. Photo Stephan Wolschon. 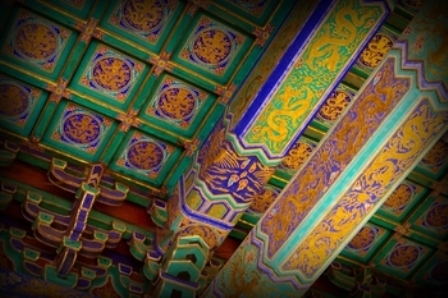 Colorfully painted ceiling in the Hall of Prayer. Photo Lauren. Testing the acoustics of the Echo Wall. Photo Paco Alcantara. Entrance to the Abstinence Palace. Photo Brian Jeffery Beggerly. 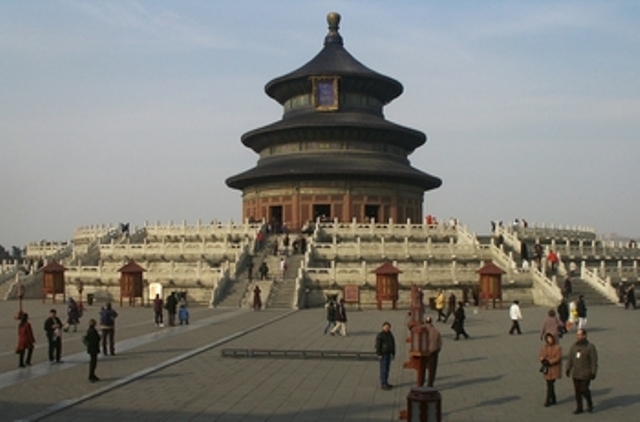 The Temple of Heaven, or more literally the Altar of Heaven (天坛; Tiān Tán) is a temple of Chinese religion used for imperial ceremonies for five centuries. Its buildings are situated in their own large and tranquil park in southeast Beijing. 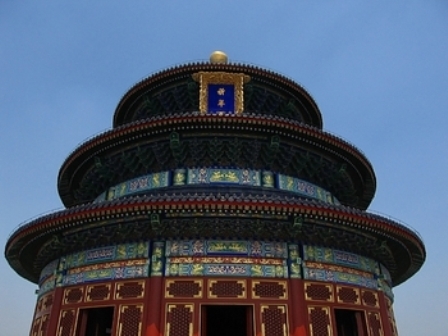 Construction of the Temple of Heaven began during the reign of Emperor Yongle was completed in 1420. It was used by all subsequent Emperors of the Ming and Qing Dynasties. In imperial China, the emperor was regarded as the Son of Heaven, the intermediary between Earth and Heaven. To be seen to be showing respect to the source of his authority, in the form of sacrifices to heaven, was extremely important. 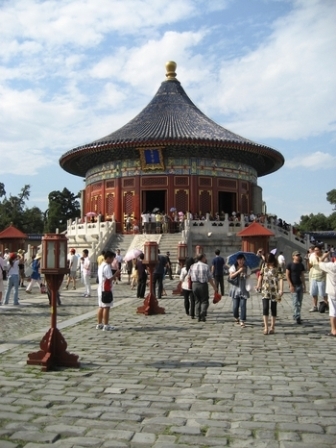 The Temple of Heaven was built for these ceremonies. The most important ceremony of the year took place on the winter solstice, when the emperor prayed for good harvests. After three days of fasting, the emperor and his entourage, wearing splendid robes, would make their way to the park on the day before the solstice. It was forbidden for the commoners to catch a glimpse of the great annual procession; they had to bolt their windows and remain in silence indoors throughout the event. Upon arrival at Tian Tan, the emperor meditated in the Imperial Vault, ritually conversing with the gods on the details of government. He then spent the night in the Hall of Prayer for Good Harvests. The next day, the winter solstice, he performed animal sacrifices before the Throne of Heaven at the Round Altar. The rituals were planned to the smallest detail according to numerological theories. The ceremony had to be perfectly completed, for the smallest of mistakes would constitute a bad omen for the whole nation in the coming year. Speaking of bad omens, the Hall of Prayer was destroyed by a lightning strike in 1889. The official explanation for this appalling event was that is was divine punishment meted out on a caterpillar that was about to crawl onto the golden ball of the hall’s roof. For allowing this to happen, 32 court dignitaries were executed. The hall was then faithfully rebuilt according to the original Ming design. The temple complex remained forbidden to all but the emperor and his retinue until the gates were thrown open to the people on the first Chinese National Day of the Republic in October 1912. On December 23, 1914, General Yuan Shikai performed the ancient ceremonies himself, as part of his attempt to be proclaimed emperor. He died before the end of the year. That was the last time Tian Tan was used for ritual ceremonies. It has since been a museum open to the public. The site was registered on UNESCO’s World Heritage List in 1998. You may have seen this castle as a ninja training school in James Bond’s You Only Live Twice. It also appeared in The Last Samurai, several Kurosawa movies, and in the TV miniseries, Shogun. 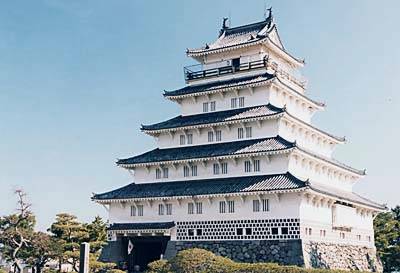 Also known as the “White Heron Castle”, Himeji Castle was originally built in the 14th century, and then rebuilt in 1580. 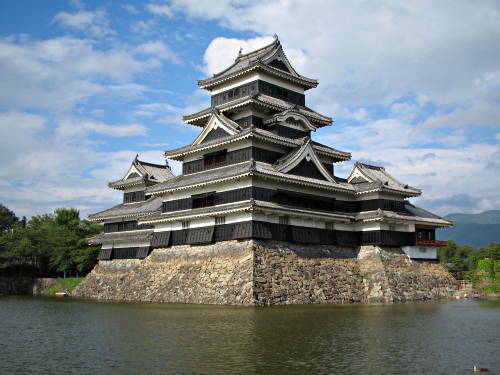 Matsumoto Castle was built in the 16th century and is sometimes called Crow’s Castle because of it’s black color. Also known as “Mist Castle” because of the legendary mist that obscures the castle when enemies approach. 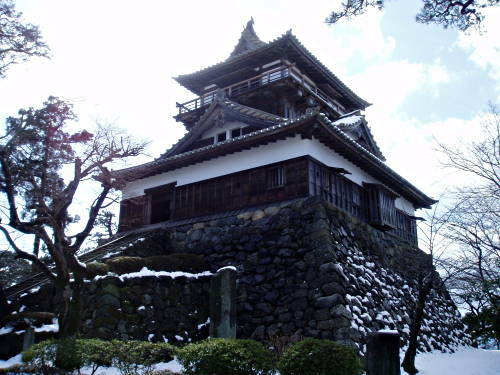 Maruoka Castle was built in 1576 and is located in Sakai, Japan. 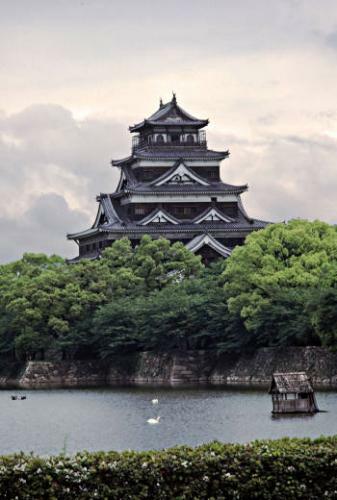 Hiroshima Castle was built in the 1590s and destroyed in WWII by an atomic bomb. It has since been rebuilt and is now a museum. Originally built with a double moat in the 17th century, Fukuyama Castle was a major castle of the Edo Period. It was rebuilt after WWII and contains a history museum. 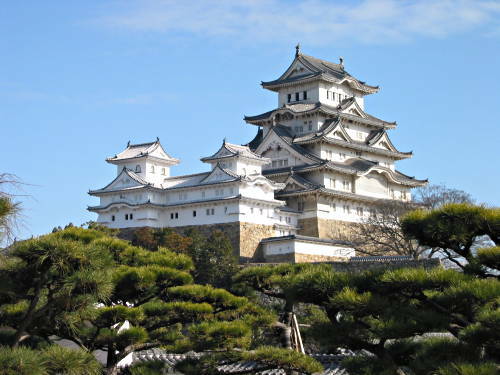 Built somewhere between 1394 and 1427, Kiyosu Castle is located in Aichi Prefecture, Japan. It was a base of Oda Nobunaga who appeared in the Kurosawa movie Kagemusha, and as Goroda in James Clavell’s Shogun. 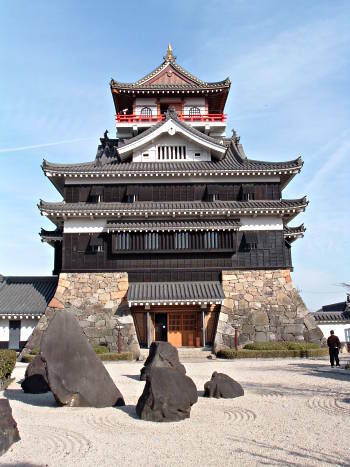 Also known as the “Black Castle”, it is one of the few castles in Japan that is the original wooden form. From the outside it looks like a five-story castle, but has a hidden sixth-level. Matsue Castle was completed in 1622. 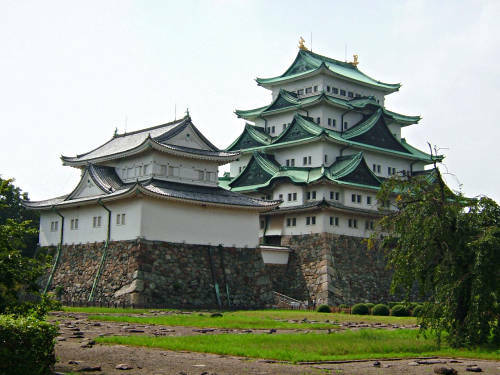 Built in the early 16th century, Nagoya Castle was rebuilt after being destroyed in WWII where it was also used as a POW camp. 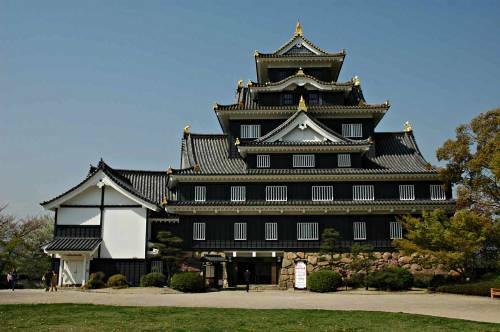 Okayama Castle is a spectacular black castle located in Okayama Japan sometimes called “Crow Castle”.